Disk herniations come in all sizes and shapes and they cause all sorts of symptoms. Some symptoms, such as leg pain, numbness in the legs, and muscular weakness can be improved with surgical treatment, whereas some symptoms, such as back pain, are less likely to improve. The best candidates for a microscopic discectomy are people with a disk herniation that is causing significant nerve root compression and the patient wants the nerve root pain alleviated. 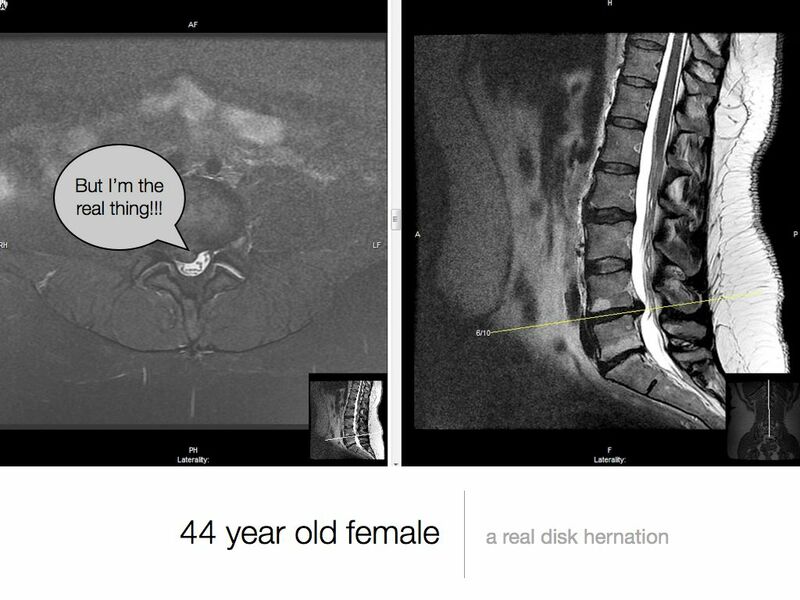 For example, here are a series of slides from a talk that I give on MRI anatomy of the lumbar spine that demonstrate the different types of disk hernations. Click on each image to enlarge it to full size and to see the caption….. They have tried a course of physical therapy, NSAIDs, and possibly a selective nerve root block and each time the pain has come back. If most, or all of these criteria are met, then having a microscopic discectomy is a reasonable choice. In my practice, A microscopic discectomy is always an outpatient operation. The patient is typically able to return to work within 2 weeks, and back to basically completely normal activity by 6 weeks. Why choose Microscopic Surgery at Monterey Spine? Working as a combined orthopedic and neurosurgical team, Dr. Gollogly and Dr. Dimitrov successfully perform more microscopic outpatient spine surgeries each month than any other team in California, setting us apart as a leader in outpatient microscopic spine surgery. Our dedication to outpatient microscopic spine surgery procedures has made us the busiest outpatient center in California. A high volume of cases results in local expertise that helps hundreds of patients get back to their daily lives with less pain. 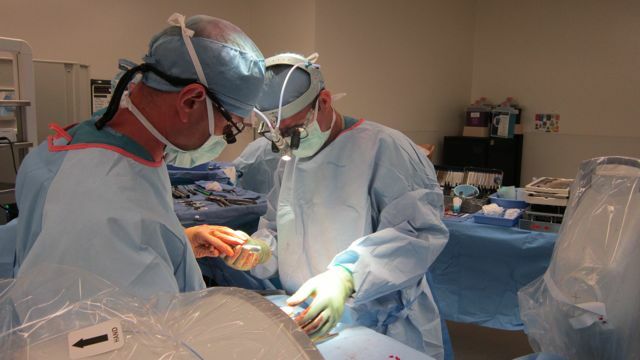 Dr. Gollogly and Dr. Dimitrov focus on avoiding fusion surgery. They believe that careful surgical craftsmanship will alleviate nerve root pain in the operating room and spinal stability can be achieved through careful physical rehabilitation. This makes many fusion procedures unnecessary. With over 20 years of combined experience working together as a team, Dr. Gollogly and Dr. Dimitrov combine the expertise of neurosurgery and orthopedic surgery into one team that produces excellent results. These procedures are performed in an Ambulatory Surgery Center that is the nation’s leader in bundled payments. As an “in network” facility with transparent pricing, Monterey Peninsula Surgery center delivers fantastic results at a reasonable price. 99% of patients who have surgery in Monterey report that they are “very satisfied” with their experience and would recommend it to a family or friend. *Risk Factors for 30-Day Unplanned Readmission and Major Preoperative Complications After Spine Fusion Surgery in Adults: A Review of the National Surgical Quality Improvement Program Database. Su AW et al., Spine (Phila Pa 1976). 2016 Oct 1;41(19):1523-1534. One of the more frequent reasons that a younger athletic patient, meaning anyone from the age of about 15 to 25, comes to see me in consultation is because they have severe activity related back pain that hasn’t responded to the usual treatments of rest, a couple of weeks of reduced activity, and over the counter anti-inflammatory pills. It’s a really challenging situation because in almost every case, the athlete can rest, rehabilitate, and get back to about 80% of their peak performance, but once they try to push it to become game ready, their pain returns. a 16 year old nationally ranked tennis player with plans to play Division 1 college tennis has been plagued by left sided back pain for the last 6 months. The pain is directly related to the number of overhead serves that he makes and to the number of sets that he plays. He has no pain at rest, no pain while cross-training, and no pain while playing at less than 80% of his full speed, hard hitting game. However, once he steps it up to match level play, after a few sets his back starts to seize up and he has had to withdraw from several tournaments. a 17 year old competitive cross-country runner was cross training under the supervision of a strength and conditioning coach when she felt a sharp “pop” in her back while squatting with moderately heavy weights. Ever since, she has severe pain when sprinting, stair-climbing, or performing weighted lunges. The rest of the time she is basically normal. The injury happened over a year ago and in spite of rest, chiropractic massage, ice, and anti-inflammatories, she can’t sprint without her back seizing up. I see similar histories up to about 25 years of age, so if this sounds familiar, keep reading. These findings are pretty common. 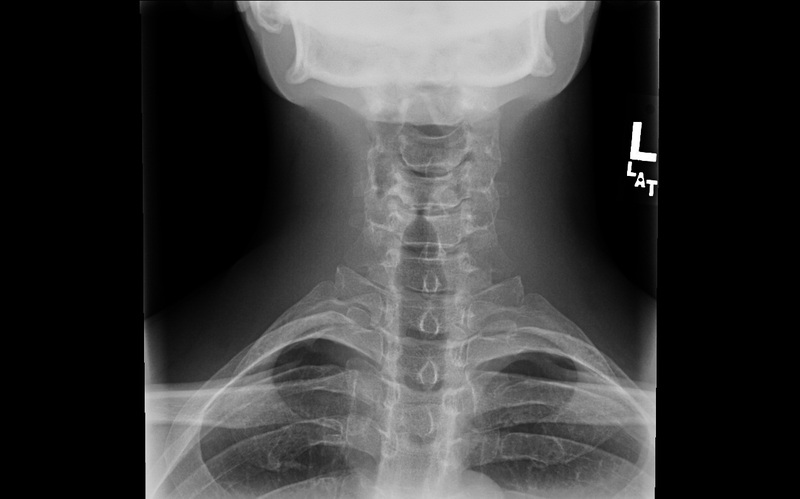 For example, in a study of 19 competitive gymnasts attending a training camp that were selected basically at random and had MRI scans of their spine, spondylolysis was found in 3 of the 19 athletes, spondylolisthesis in 3 as well, and focal bone-marrow edema was found in both L3 pedicles in one gymnast. 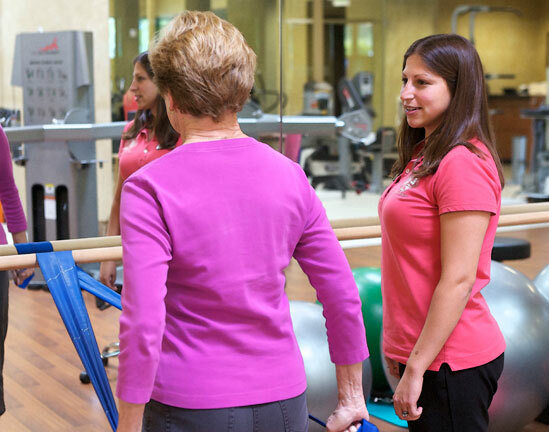 Since most of the patients are accomplished athletes to begin with, the usual prescription for six to eight weeks of physical therapy is rarely of much benefit. Most of the time they have already seen one or two trainers, conditioning coaches, or chiropractor-type practicioners before they come and see me, and they are usually pretty frustrated. Here are a couple of sample X-rays and MRI scans showing the findings that accompany them on their first visit. These two slices of an MRI scan demonstrate a “stress reaction” in the pedicle of the vertebral body. The stress reaction shows up as white area in a part of the bone that normally has a darker appearance on MRI. This particular sequence of the MRI scan is formatted so that water shows up as a bright white signal and the presence of increased water content in this area is said to represent bony “edema”. Edema is defined as “a condition characterized by an excess of watery fluid collecting in the cavities or tissues of the body”, and we see edema in the bone underneath the cartilage of arthritic joints, surrounding fractures, and in bone that has been bruised by hard impacts. Here are a couple of examples of bony edema. The presence of bony edema is definitely a pathologic finding. Something is wrong with the musculoskeletal system in the immediate area and the bone is not happy. 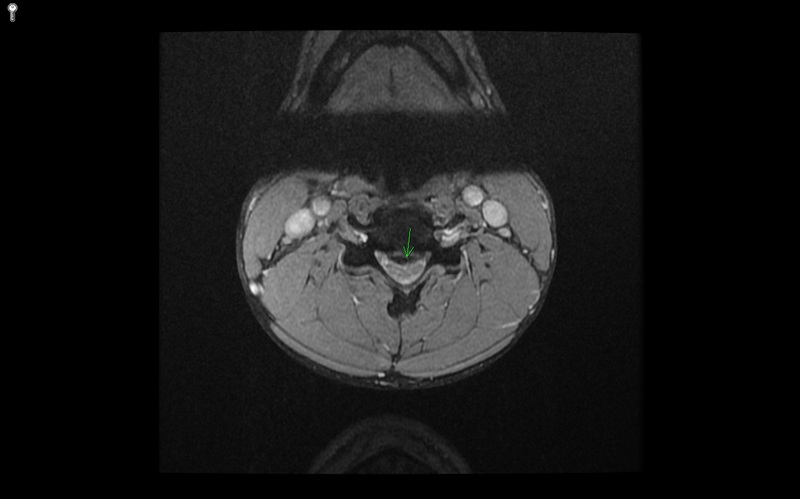 In this case, this MRI scan belonged to a 16 year old male football player who was working out with a conditioning coach who was having him squat very deeply with pretty heavy weight — on the order of 1.5 times his body weight — and his pain seemed to be due to hyperextension of the spine at the bottom of the squat. 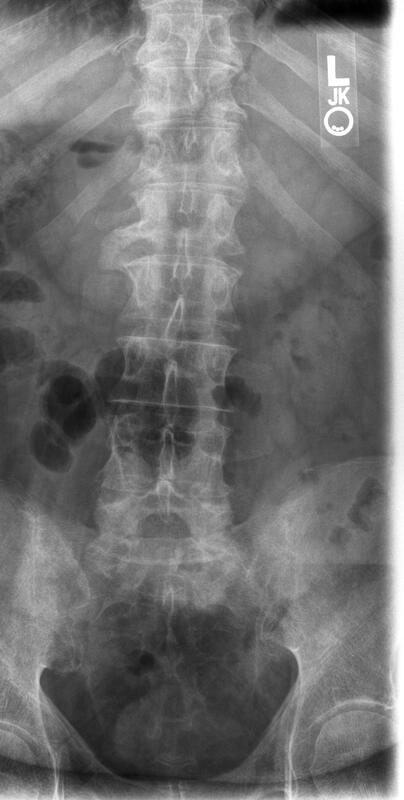 Here is an example of a spondylolysis or a “pars defect” of L5. In this case there is a physical break in bone across the pars inter-articularis. The break is usually described by the radiologist as a defect, a lysis, or a stress fracture. All of these terms are synonymous, and they all indicate that there is a physical gap in the bone. Occasionally I will get a patient who comes to the office in a bit of a panic after being told that he or she has a “fractured spine”, but this is probably a bit too strong of a phrase to describe this finding accurately. 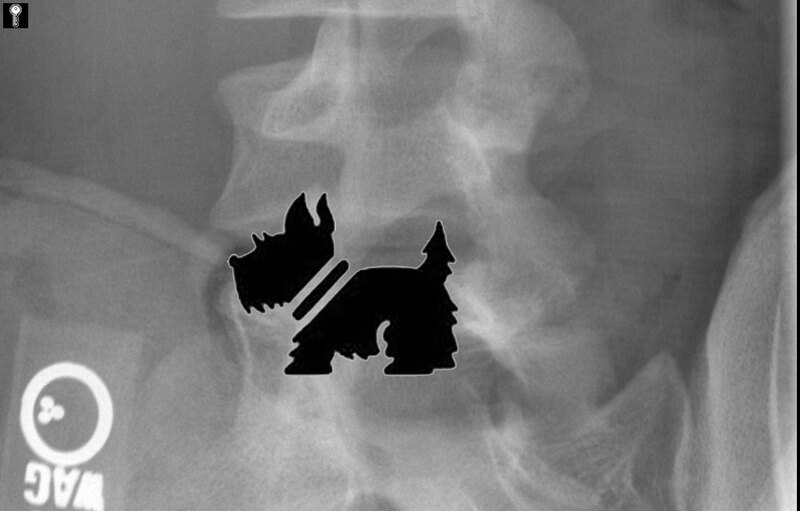 The classic X-ray finding of a spondylolysis is known as the “scotty dog” sign. This sign describes the manner in which the spondylolysis defect can look (to someone with a very healthy imagination) like the collar on a scotty dog on the oblique views of the limbo-sacral junction. While the gap can be seen on plain X-ray, often a CT or an MRI scan is needed to really confirm that it is there, because the X-ray can be a little bit unclear. The reason why the use of the word “fracture” is not terribly appropriate here is because this is typically not an acute break, the gap in the bone is often filled with fibrous tissue, and there is usually some degree of residual stability to the vertebral body. Sometimes there is edema surrounding the defect, and sometimes not. Typically, patients with more severe back pain tend to have relatively more edema, but this is not a perfect relationship. 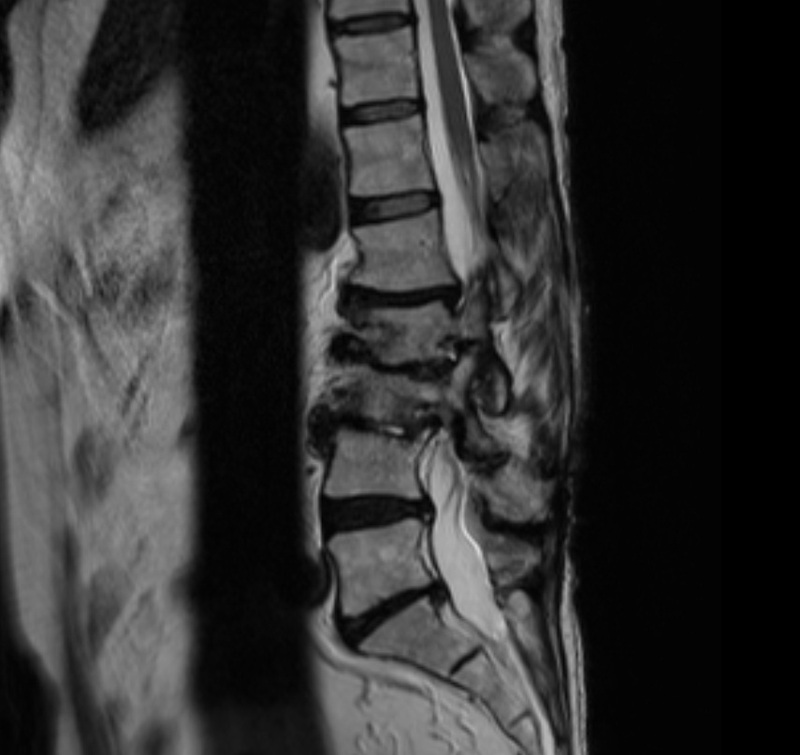 Finally, here is a case of spondylolisthesis at L5/S1. 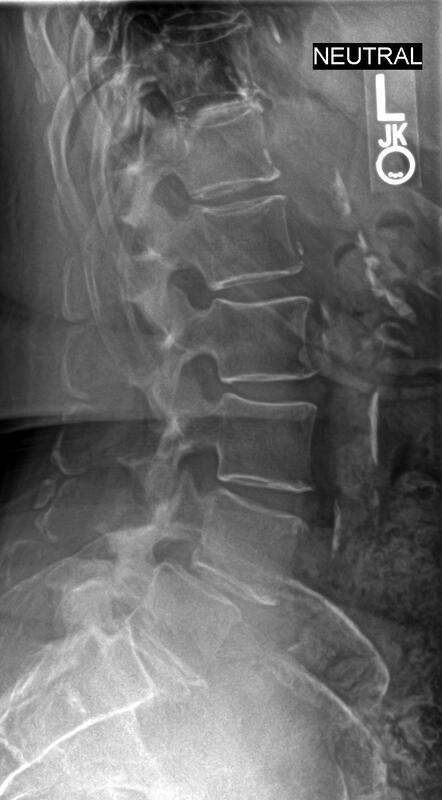 In this case the to halves of the vertebral body have started to move apart and the spondylolysis defect is noticeably larger. The overall alignment of L5 with respect to S1 has shifted, and L5 has slipped anteriorly with respect to S1. 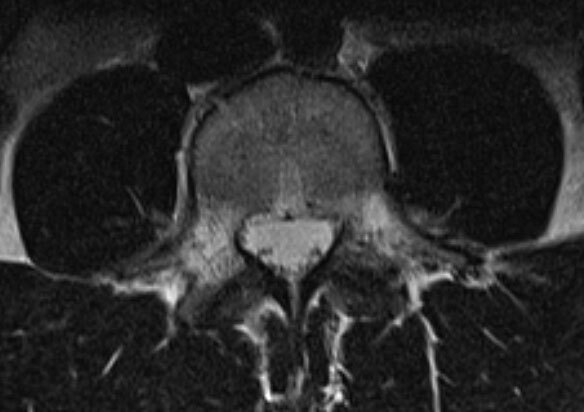 This finding is more common in females who tend to have more supple ligaments and presumably more flexible intervertebral disks, and it is more common in patients with more vertically oriented L5/S1 disk spaces, presumably because there are greater forces acting to displace L5 on S1 in patients with more lumbar lordosis and vertically oriented sacral endplates. Let’s imagine that all three of these patients have pain only with strenuous athletic activity. Why? My opinion is that area where the stress reaction, pars defect, or spondylolisthesis occurs is placed under some sort of tension or stress ONLY when the spine is moved to the limits of its range of motion under the heavy loads of torque, muscular contraction, and athletic movement. For example, it’s not hard to imagine why the lumbar spine would be stressed during the twisting, lunging, and hitting motions of these competitive tennis players in ways that are fundamentally different than the stress imposed by the more mundane activities of daily life. Will it heal? This seems to be the most frequent first-asked question once the diagnosis has been made, and the important thing that needs to be clarified what you meant by “healed”: less pain or a normal X-ray or MRI scan? 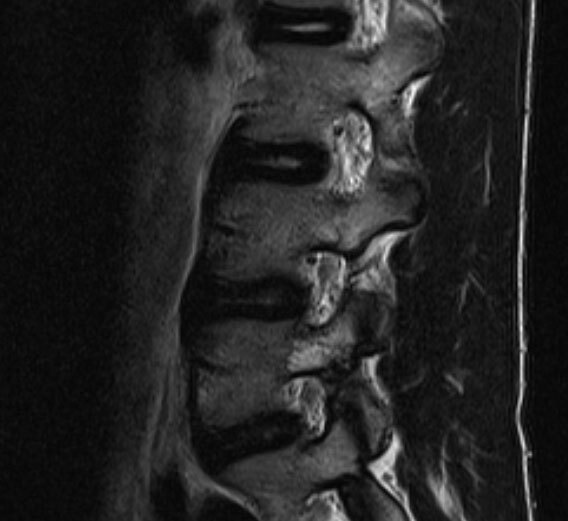 When it comes to the actual findings on the X-rays or the MRI scan it’s hard to know for sure, but my opinion is that the stress reaction will probably subside and will not necessarily progress to a spondylolysis if the activity responsible for the pain is not a repetitive motion that the athlete plans to continue to perform. I think that once a spondylolysis has occurred, it is usually going to be a persistent defect and if there is any evidence of anterior displacement in the form of a spondylolisthesis bone certainly won’t bridge the gap or restore the alignment back to normal. Should I use a bone stimulator? Unclear. 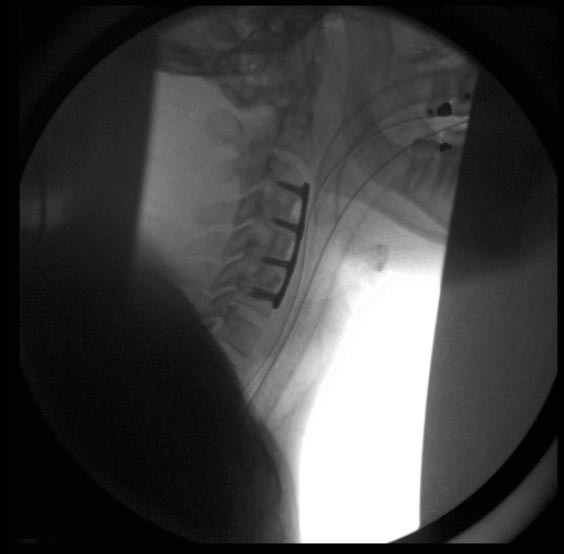 Most patient’s will improve with some form of conservative treatment, so the gold standard supporting the use of a bone stimulator would be radiographic evidence of healing of the spondylolysis defect after treatment. As of 2013, there are no studies that have not been any published studies that have conclusively demonstrated that a bone stimulator results in radiographic healing in a large series of patients. In my practice, I leave the decision up to the athlete and the parents and to be perfectly frank, it usually comes down to a question of insurance coverage. If the family has good insurance and they are not terribly bothered about the cost, I have no problem recommending and prescribing a bone stimulator. However, it’s not something that I would push, especially if it was going to cause any financial hardship. What about rehab? This is the most interesting part of the entire problem and the question that I think the most about. Here’s a short video on a competitive cross-fit athlete that successfully rehabilitated herself back to a very high level of functional movement after having an episode of back pain that appears to be due to a spondylolysis or spondylolisthesis. I’ve been a big fan of Kelly Starrett for a number of years — mostly as a result of my own Crossfit experiences as a 40 year old + athlete, and I think he does an excellent job of explaining the body mechanics of a “stable” and “organized” spine and how this type of posture can reduce the stress and strains on the lumbar spine during functional movements. I’ve had a lot of good results with patients when I refer them to particular physical therapists who are skilled in coaching olympic weightlifters and who have a solid understanding of the protective effects of good posture and core strength and endurance. This is where I personally try to put most of my emphasis, but it’s hard to unlearn habits that work. For instance, in the case of the competitive tennis player who was case #1, his serve worked for him. He was able to achieve killer spin and power with dramatic hyperextension of his lumbar spine, and while his pars paid the price, so did his opponent. Unlearning that serve seems unlikely, but with a combination of cross training, postural education, and attempts to change his style of hitting, he has managed to reduce his pain to the point where he can play with a tolerable level of discomfort. My advice is: spend the money on good coaching. The coast of california seems to have more Crossfit gyms than 7-11’s these days, and the increasing popularity of olympic weightlifting — with it’s attendant risks and benefits — has lead to a dramatic increase in the number of people in the local athletic community who really are knowledgeable about the ways to protect and stabilize the spine during functional movements under the loads imposed by athletics. 1. Skeletal Radiol. 2006 Jul;35(7):503-9. Epub 2006 Mar 7. 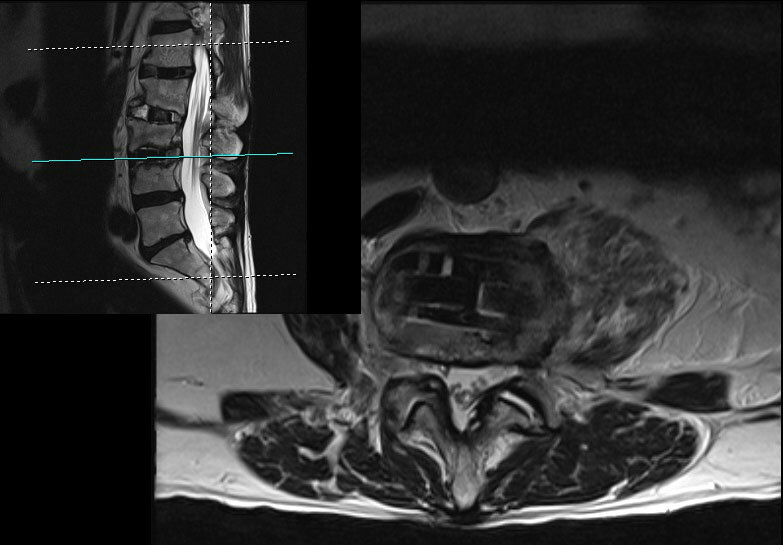 Lumbar spine MRI in the elite-level female gymnast with low back pain. Bennett DL, Nassar L, DeLano MC. Previous studies have shown increased degenerative disk changes and spine injuries in the competitive female gymnast. However, it has also been shown that many of these findings are found in asymptomatic athletic people of the same age. Previous magnetic resonance imaging (MRI) studies evaluating the gymnastic spine have not made a distinction between symptomatic and asymptomatic athletes. Our hypothesis is that MRI will demonstrate the same types of abnormalities in both the symptomatic and asymptomatic gymnasts. 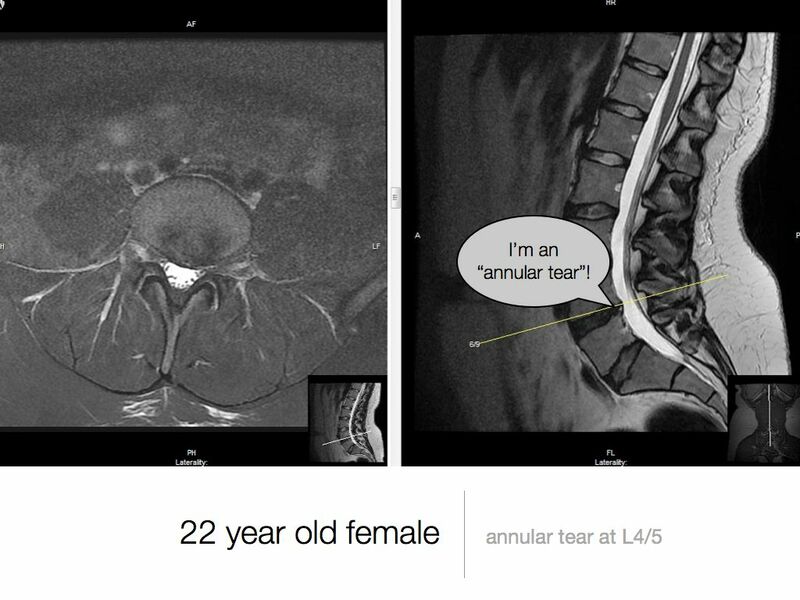 Olympic-level female gymnasts received prospectively an MRI exam of the lumbar spine. Each of the gymnasts underwent a physical exam by a sports medicine physician just prior to the MRI for documentation of low back pain. Each MRI exam was evaluated for anterior apophyseal ring avulsion injury, compression deformity of the vertebral body, spondylolysis, spondylolisthesis, degenerative disease, focal disk protrusion/extrusion, muscle strain, epidural mass, and bone-marrow edema. Nineteen Olympic-level female gymnasts (age 12-20 years) were evaluated prospectively in this study. All of these gymnasts were evaluated while attending a specific training camp. Anterior ring apophyseal injuries (9/19) and degenerative disk disease (12/19) were common. 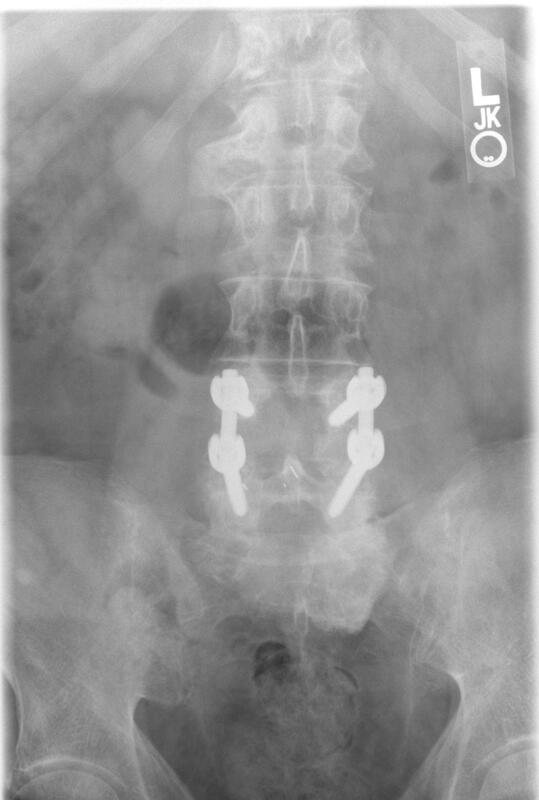 Spondylolysis (3/19) and spondylolisthesis (3/19) were found. Focal bone-marrow edema was found in both L3 pedicles in one gymnast. History and physical exam revealed four gymnasts with current low back pain at the time of imaging. There were findings confined to those athletes with current low back pain: spondylolisthesis, spondylolysis, bilateral pedicle bone-marrow edema, and muscle strain. Our initial hypothesis was not confirmed, in that there were findings that were confined to the symptomatic group of elite-level female gymnasts. Spondylolisthesis is a medical term that describes an abnormal anatomic alignment between two bones in the spine. 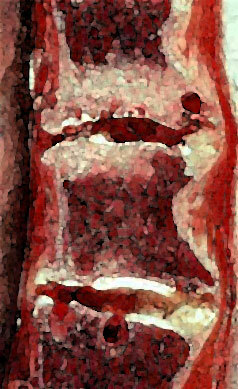 This anatomic abnormality has been around since antiquity. It was first described in the modern medical literature by a Belgian obstetrician named Dr. Herbinaux. In 1782, Dr. Herbinaux noticed that the abnormal alignment of the lumbar spine and pelvis in very severe cases made natural childbirth difficult. 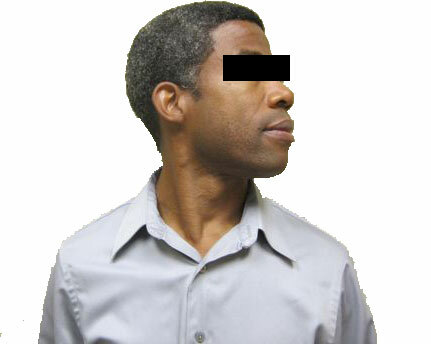 He was the first one to name this condition in which one vertebral body is slipped forward with respect to the one underneath it. 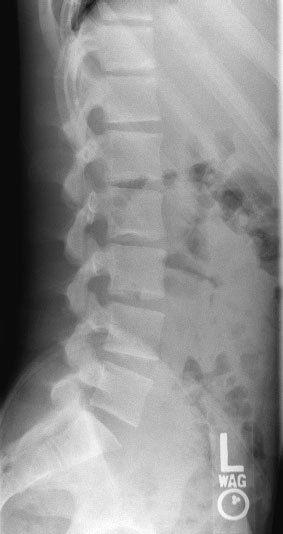 The term spondylolisthesis comes from two greek words: “spondy” (σπονδυλος) which means “vertebra” and “listhesis” (ὁλισθος) which means “a slip”. 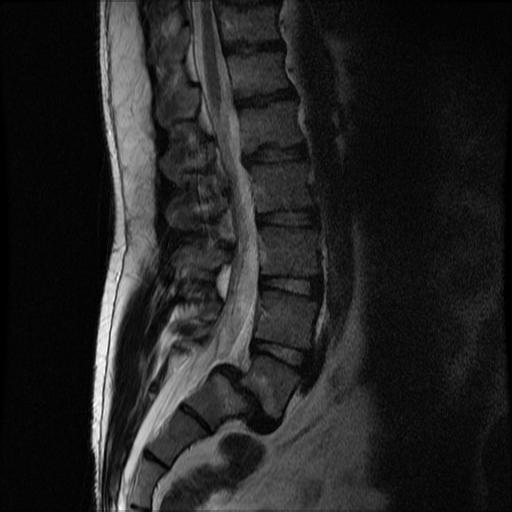 Spondylolisthesis most commonly affects the lower lumbar spine, typically at the L4/5 or L5/S1 levels. 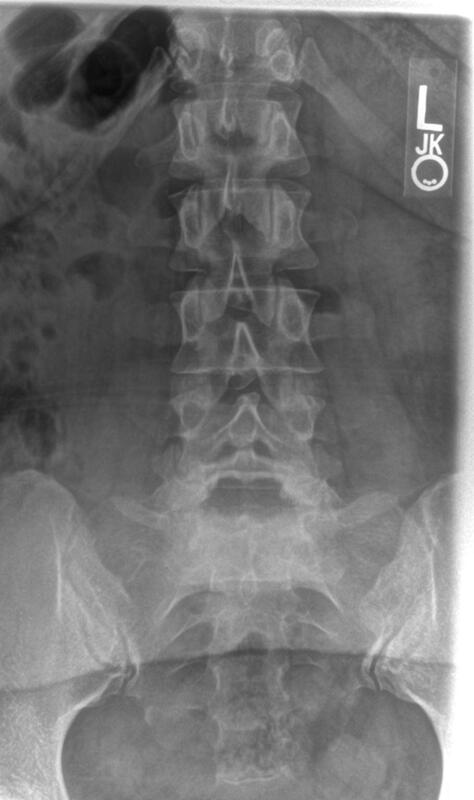 Spondylolisthesis is a very common condition, occurring in about 5% of the population. 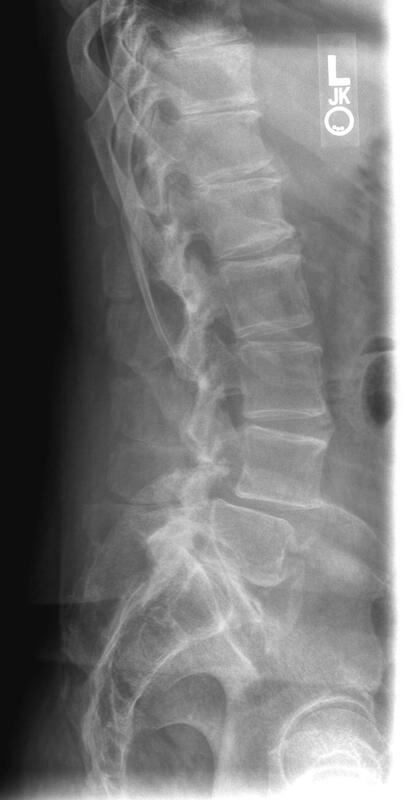 The most common type of spondylolisthesis is a degenerative slip that occurs at the L4/5 level. This type of slip is caused by degeneration of the intervertebral disk and the facet joints. Natural aging results in an increase in the “sloppiness” of the joint, much like a worn bushing in a car. Here are two images that depict the changes that occur as the disk degenerates. The gel-like substance inside the disk shrinks, the edges of the disk become irregular, and bone spurs develop. In this series of images, I use a CV joint from a car to illustrate how the spine is a mechanical joint and many years of “wear and tear” will cause the joint to become sloppy. A recent clinical consensus paper was produced by the North American Spine Society will be referenced throughout this guide. 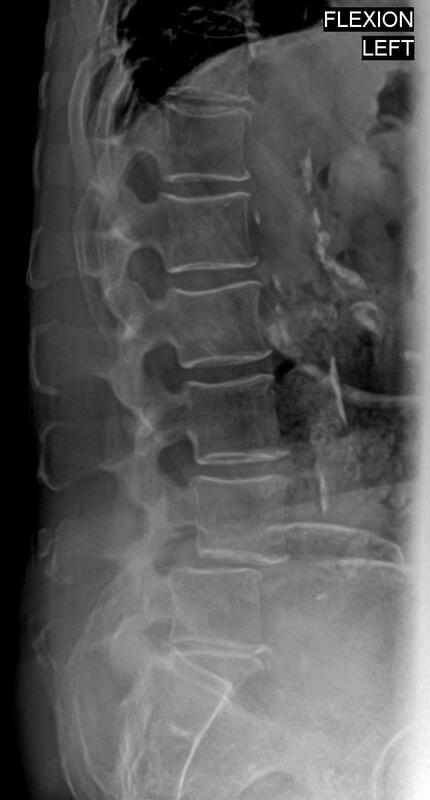 Their version of the “best working definition” of a degenerative lumbar spondylolisthesis is as follows: an acquired anterior displacement of one vertebra over the subjacent vertebrae, associated with degenerative changes, without an associated disruption or defect in the vertebral ring. 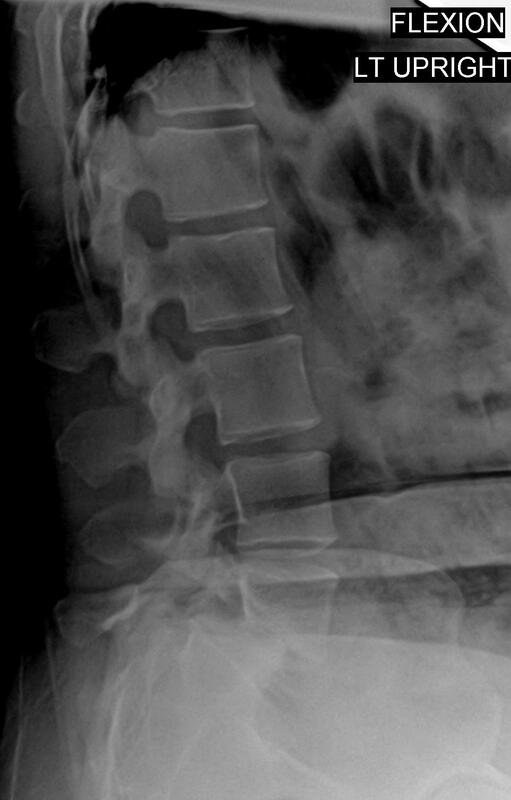 The key elements in this definition — anterior slip, degenerative change, and no disruption of the vertebral ring are easy to demonstrate in a typical case of spondylolisthesis. As the disk deteriorates it becomes less capable of absorbing all of the forces of normal human movement. Because the joint has increased “play” or “sloppiness” L4 starts to slip forward with respect to L5. 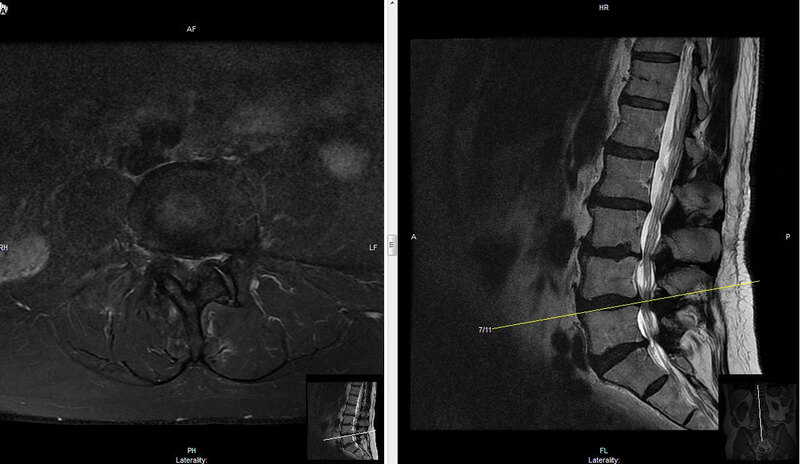 Here are X-rays and an MRI scan of a typical case of a grade 1 spondylolisthesis. Flexion and extension X-rays are often used to evaluate how much abnormal motion occurs at the level of the spondylolisthesis. 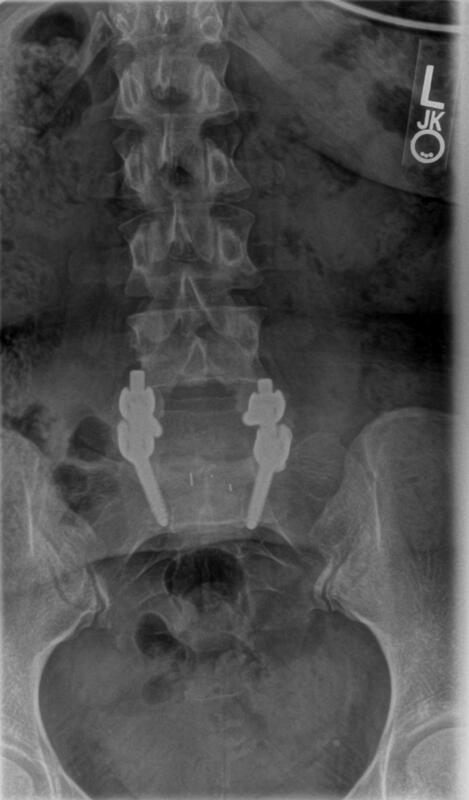 The second most common type of spondylolisthesis that we see occurs at L5/S1. This condition is especially common in people who have repetitively extended their spine during athletics in adolescence. The theory is that repetitive hyperextension of the spine during athletics results in a stress fracture. This stress fracture called a spondylolysis. The stress fracture occurs in a part of the vertebral body called the pars inter-articularis which disrupts the continuity of the vertebral ring. The lack of a connection between the posterior and anterior parts of the L5 vertebral body allows the L5 vertebral body to slip forwards with respect to S1. The association between adolescent athletics and this condition is very strong. About 95% of competitive gymnasts and about 35% of competitive football players have X-ray evidence of the stress fracture that may result in a spondylolisthesis later on in life. Patients with spondylolisthesis complain of low back pain and pain along the course of the nerves that are pinched by the spondylolisthesis. The narrowing of the normal space available for the nerve roots in the spinal canal is called stenosis. The back pain typically occurs in the area of the lower lumbar spine and often radiates around the abdomen and into the buttocks. The location of the nerve root pain depends upon where the slip is occurring and where the nerve roots are compressed. Nerve root compression due to stenosis is called a radiculopathy: radix is the greek word for “root” and pathos a word for “a disease of”. Pain and numbness in the legs as the result of a spondylolisthesis occurs in patterns called a radiculopathy that are very characteristic. The human body is divided into a series of dermatomes which can be visualized as a map of where the nerves travel after the leave the spinal canal. When the root of the nerve is affected, the entire course of the nerve is typically painful, numb, or the skin in this area is unusually sensitive. For example, here is a map of the normal dermatomes of the body, and then three diagrams of an L4, L5, and S1 radiculopathy. 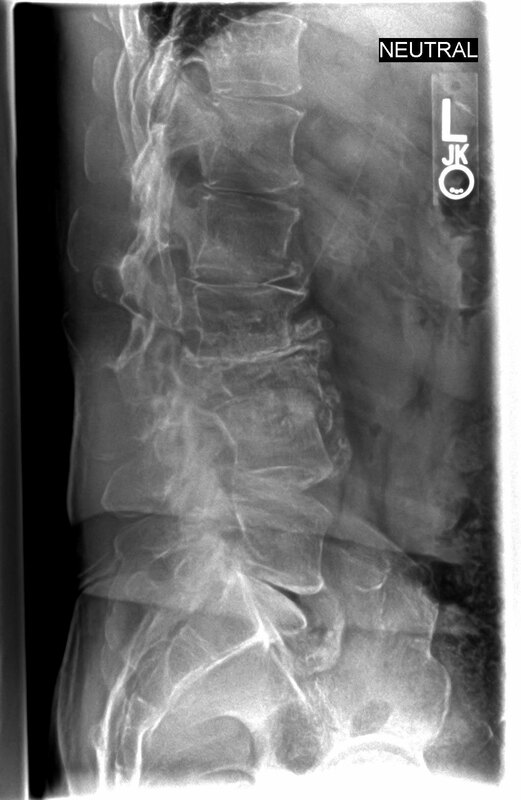 Patients with a spondylolisthesis at L4/5 usually have L5 nerve root pain due to compression of the L5 nerve root in the neural foramen. Patients with a slip at L5/S1 usually have both L5 nerve and S1 root pain due to tension on the nerve roots. 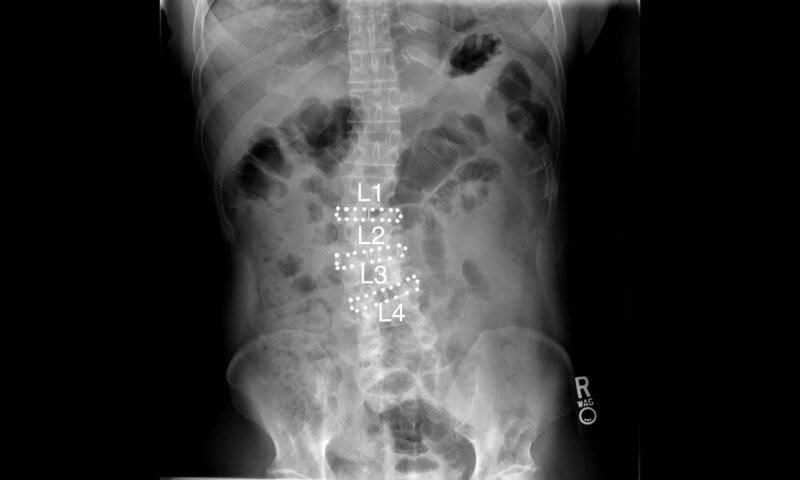 For example, a patient with an L4/5 spondylolisthesis will usually describe low back pain at the base of the spine, radiating into the buttocks. There is usually also pain and numbness along the sides of the legs, down the front and sides of the calves, with numbness and tingling in the feet. If your major problem is pain and numbness in the legs, and especially if it is only affecting one leg, you may be a good candidate for a microscopic decompression instead of a fusion. If you are interested in exploring this option, I may be able to review your MRI scan for you. The pain that is associated with spondylolisthesis is variable. It is often worse with standing. Many patients find that the length of time they can walk comfortably gets shorter and shorter as the disease progresses. We call this finding “limited walking endurance”. This is often an indicator of how severely the patient is affected and how much nerve root compression they have. Patients who are able to walk for more than an hour rarely need operative treatment. Those who can only walk for a few hundred yards before they are limited by back and leg pain are more likely to require surgery. 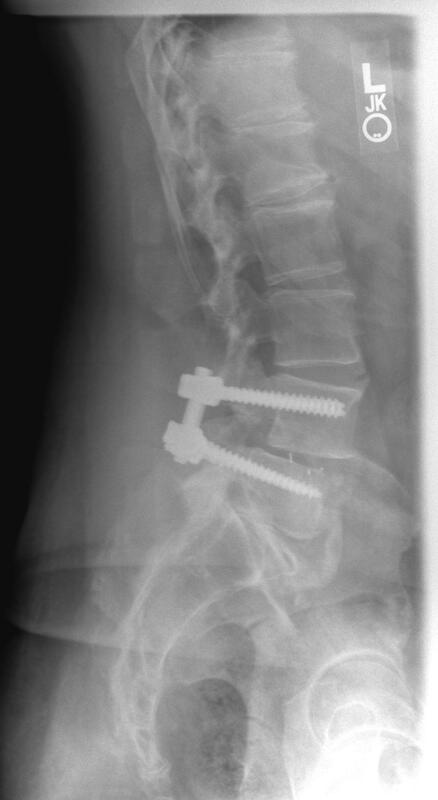 These patients will often experience substantial relief once their spondylolisthesis is corrected. While the pain associated with a spondylolisthesis is usually worse when the patient is on their feet, many patients have a hard time sleeping at night because the nerve root pain keeps them awake. Xray and MRI findings in spondylolisthesis. 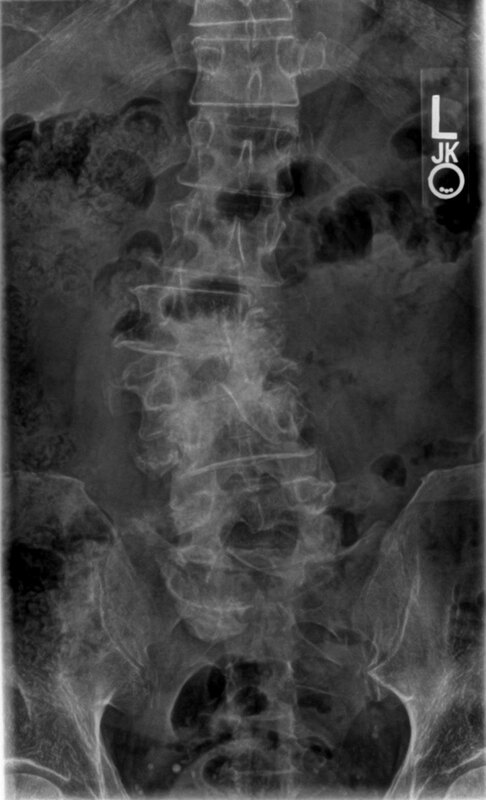 The best test for diagnosing a spondylolisthesis is a lateral Xray of the lumbar spine with the patient standing. It is important that the patient is standing because there are some slips that return to their normal position when the patient lies down. 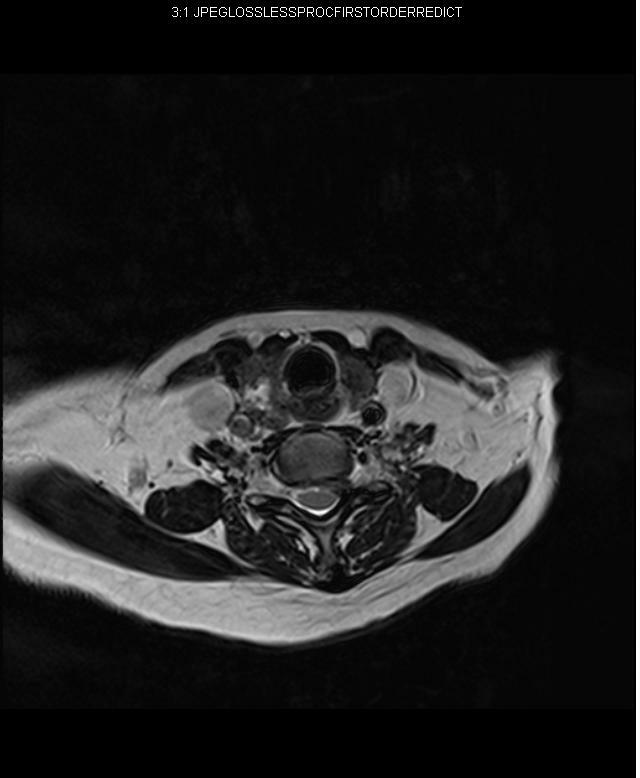 This is why some cases of spondylolisthesis are not apparent on supine X-rays or an MRI scan. 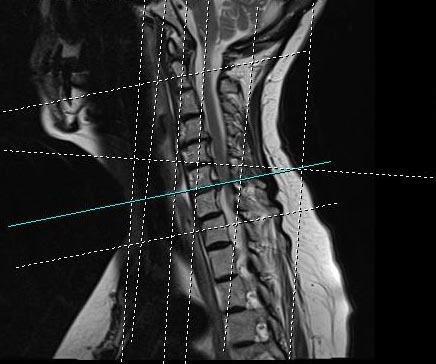 The best test for evaluating the degree of nerve root compression and spinal stenosis caused by spondylolisthesis is an MRI scan of the lumbar spine. 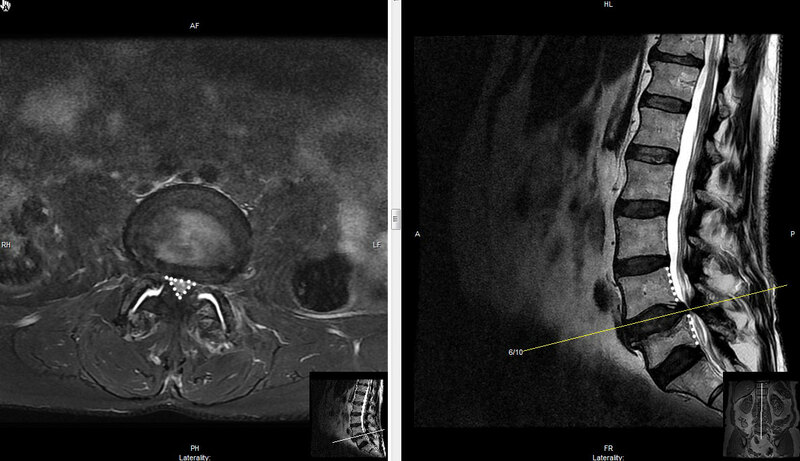 And here are the X-rays and MRI scans of a patient with an L5/S1 spondylolisthesis with bilateral pars defects. PT helps to stabilize the lumbar spine and will often result in a decrease in symptoms of low back and leg pain to the point where surgery becomes unnecessary. This type of therapy MUST emphasize active rehabilitation, which means that the patient must work actively to strengthen the muscles of the abdomen, low back, and core. Massage, hot pack treatments, and electrical stimulation may feel good at the time, but their effects are usually temporary. While massage feels great, it usually does NOT result in sustained relief. The type of therapy that we employ emphasizes core conditioning and strengthening and our therapists will instruct you on how to do these exercises properly. If your symptoms are relatively mild and you are still able to exercise, hike, and play some sports, then often a Pilates or a Yoga program may be very beneficial, less costly, and more convenient than going to a physical therapist. Non-steroidal pain relievers like Aspirin, Tylenol, Motrin, and Ibuprofen are very helpful in the management of spondylolisthesis. The medications can calm down the inflammation that accompanies degenerative disk disease. This often makes it possible to participate in physical therapy with less pain. If you can do PT, it makes it possible to work harder to strengthen the muscles of the low back and abdomen. Selective Nerve Root Blocks: In our clinic we have specialists who perform selective nerve root blocks with injectable medications like Cortisone and Kenalog. These are much stronger than the anti-inflammatories you can take by mouth. These injections are performed in the surgical center and are done using an intra-operative X-ray machine to make sure that the medication is injected in the same area where the nerve root compression is occurring. In our experience, nerve root blocks are very helpful for patients. They will often result in a sufficient reduction in pain so that physical therapy is tolerable. The block may also interrupt the “cycle of inflammation” to the point where the symptoms are manageable and surgery can be avoided indefinitely. In our experience, using narcotic pain medications on a daily basis for the treatment of the pain associated with a spondylolisthesis is a bad idea. Because spondylolisthesis is a condition that tends to worsen with time, most people who start taking narcotics find it very difficult to stop. The use of narcotic pain medications for an open-ended diagnosis is dangerous. This is because there is not a defined point in the future when we know that the pain will spontaneously resolve. For example, if a patient has a fracture, we know that the pain will subside once the fracture heals. 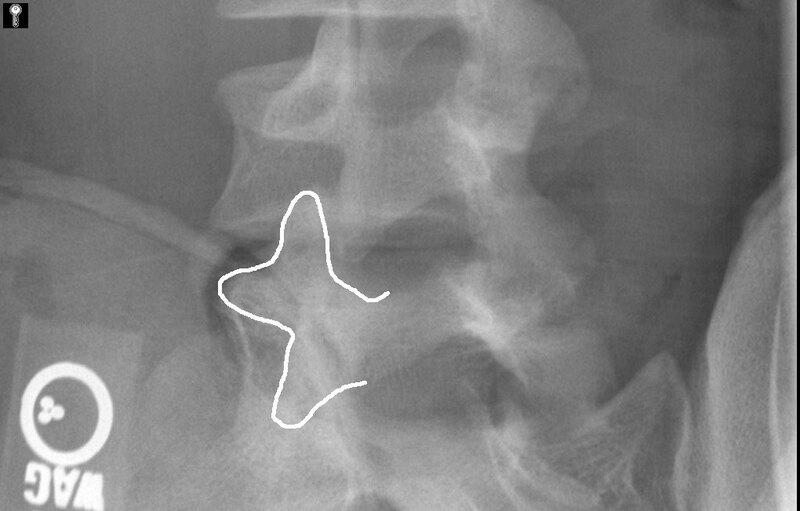 However, with a spondylolisthesis, because there is not a possibility of spontaneous correction, the patient will continue to perceive a need for narcotics on a regular basis. This quickly leads to tolerance as the medications become less effective with time and their routine use becomes habit forming. 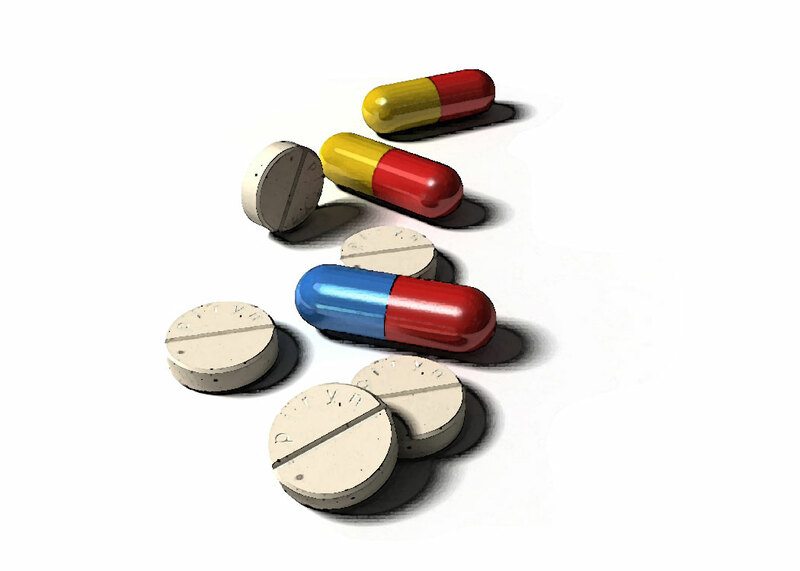 For more information on my philosophy about the use of narcotic pain medications, click here. The North American Spine Society’s consensus statement on non-operative care for spondylolisthesis is a follows: The majority of patients with symptomatic degenerative lumbar spondylolisthesis and an absence of neurologic deficits will do well with conservative care. Patients who present with sensory changes, muscle weakness, [or a short walking endurance] are more likely to develop progressive functional decline without surgery. Progression of slip correlates with jobs that require repetitive anterior flexion of the spine. Slip progression is less likely to occur when the disc has lost over 80% of its native height and intervertebral osteophytes have formed. Progression of clinical symptoms does not correlate with progression of the slip. 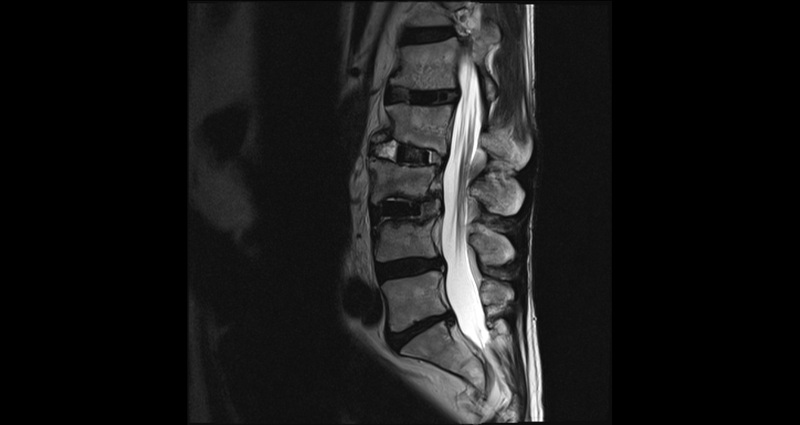 Surgery for spondylolisthesis: do you need it? 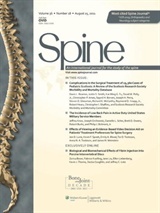 Here is what the North American Spine Society has to say: Surgery is recommended for treatment of patients with symptomatic spinal stenosis associated with low grade degenerative spondylolisthesis whose symptoms have been recalcitrant to a trial of medical and interventional treatment. In our clinic we agree with this statement. What this means to us is that patients who have symptoms that can be clearly attributed to their spondylolisthesis should first be educated about their condition. Next they should consider physical therapy and lifestyle changes that we believe are associated with improvements in back pain. If they continue to have pain they should consider a selective nerve root block to temporarily reduce the inflammation in the nerve roots — as long as this is seen as a bridge to making physical therapy more tolerable. Surgery should only be considered when the patient has continued symptoms that do not improve with physical therapy or medical management. 4. provide the patient with a durable solution that will improve their quality of life for years to come. The correct answer, according to the AANS, is #3. 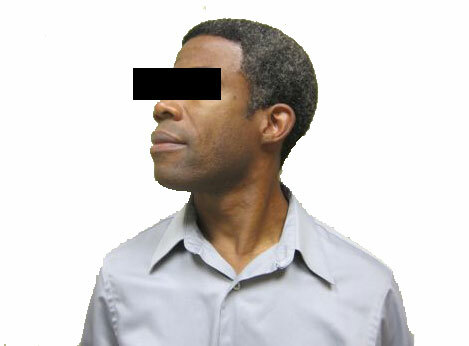 Here is their explanation: This patient has failed reasonable attempts at non-operative management and has an anatomical abnormality that corresponds to his clinical symptomatology. Surgical correction is the best option. Decompression alone in the presence of spondylolisthesis in a relatively young patient is associated with a high incidence of progressive listhesis and worsening pain. Here’s where I disagree. I think that it in carefully selected patients, a microscopic decompression with meticulous physical therapy and rehabilitation can result is excellent clinical results. When I am able to alleviate someone’s leg pain so that they can go back to working out and keep their core strong, they are happy. 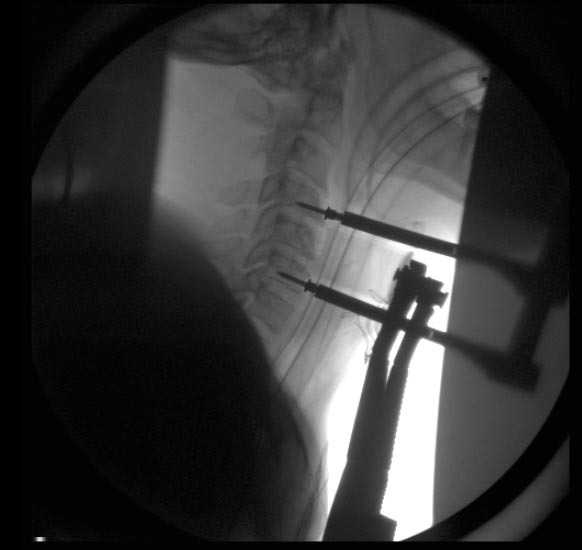 Here are a series of x-rays that demonstrate the correction of spondylolisthesis with a decompression and fusion of the slip performed in our clinic in Monterey, California. You can click on each of these Xrays to enlarge them to full size. L4.5 degenerative spondylolisthesis repaired with an L4.5 lumbar decompression, instrumented fusion, and reduction of spondylolisthesis. L5/S1 isthmic spondylolisthesis repaired with an L5/S1 lumbar decompression, instrumented fusion, and reduction of spondylolisthesis. I’ve also got a large number of patients that haven’t needed a stabilization. Instead, I’ve done a microscopic decompression for them, especially if they only have pain and numbness in one leg. 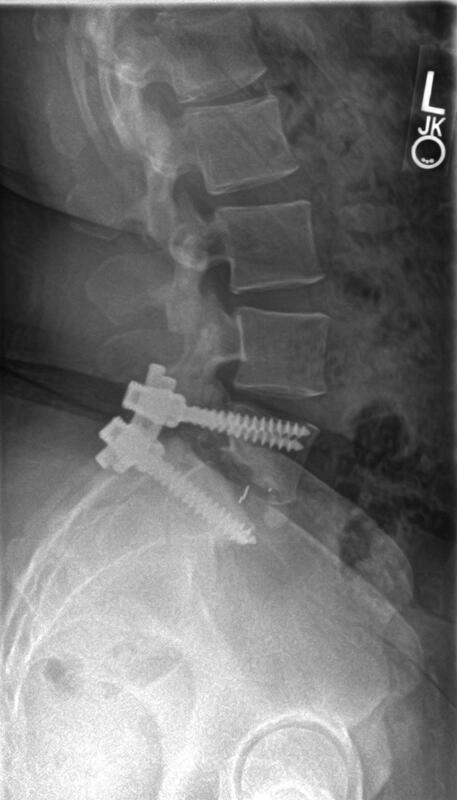 If they are able to decrease the chance of future progression of the spondylolisthesis with lumbar spine strengthening exercises, they are delighted with the opportunity to live without a fusion every day. If you’ve already had an MRI scan and are intrested in discussing your options, I will review your MRI scan for and tell you whether or not I think a microscopic decompression rather than a fusion will work in your case. To learn more about your options for non-fusion treatment of spondylolisthesis, click here: MRI review. The very first MRI scan of the human body was performed in 1977. Prior to this, we were basically making educated guesses about what was wrong with the spine. 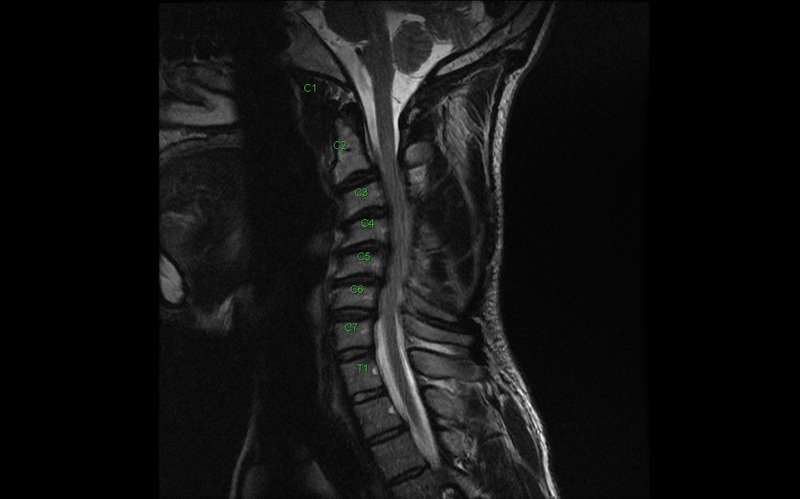 Today, the modern practice of spine surgery relies heavily on the interpretation of MRI scans. Magnetic Resonance Imaging creates thin section images of the inside of the human body. This technique allows us to visualize anatomic structures from any angle and direction. The two most common slices that we look at on MRI scans of the spine are the sagittal and coronal slices. 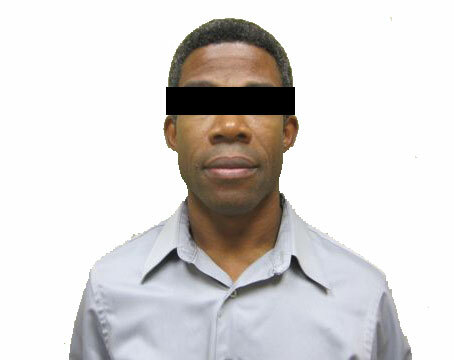 The saggital plane sections the human body lengthwise. The axial plane creates a cross section of the human body. An MRI image looks like a photograph, but it is actually a computerized image of the nuclear magnetic resonance of molecules inside the human body. These images are superior to CT scans and X-rays. The resolution and clarity of the images is better, we can see more fine detail, and this test uses harmless radio waves instead of ionizing radiation. We are going to look at examples of each of these conditions. However, before we do, it is important that you understand that after the age of 30, essentially every MRI scan of the human body is abnormal. These two pictures explain why. The natural aging process causes changes to every structure of the human body. The spine is no different. If we were to look at the skin of the gentlemen on the right with a microscope, we would see evidence of degeneration, loss of elasticity (which is called elastosis), noncancerous skin growths (called keratoacanthomas), pigment changes such as liver spots, and thickening of the skin. These findings would all be described as “abnormal”. However, we could describe the skin on the right as “normal for age”. We only describe it as abnormal when we compare it to the image of the baby on the left. Most people, even if they don’t have any back pain, will still have evidence of abnormalities on MRI scans. Disc degeneration, bulging disks, and herniated discs occur very commonly and they may not be causing symptoms of pain. For example, in a paper published in the journal radiology, the researches found that approximately 90% of people WITHOUT any history of back pain in the last 6 months still have evidence of annular tears, disc degeneration, and disc bulging at one or multiple levels. Therefore, the critical task when it comes to interpreting MRI scan is CORRELATING the findings on the MRI scan with the patient’s complaints and with the physical exam. What a normal MRI scan looks like. This is an MRI scan of a 40 year old male. There are 5 intervertebral discs in the lumbar spine. We are going to start with a normal level which has a normal intervertebral disc. Each disc separates two bones called vertebrae in the spine. In this case, this is the L3-4 disc. Above the disc is the L3 vertebral body and below the disc is the L4 vertebral body. The center of the disc, the annulus pulpous is relatively white. The front and back of the disc, the annulus fibrosis is dark black, thick, and is not bulging into the spinal canal. The spinal canal is filled with white fluid, called cerebrospinal fluid (CSF). Inside the CSF is the spinal cord and the nerve root that go down to the legs. On the axial image, the neuroforamen are wide open and there is plenty of space available for the nerve roots. 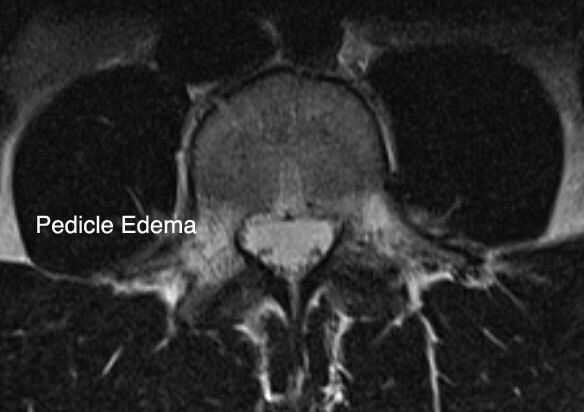 Using the same MRI scan, let’s look at a dessicated disc. Desiccation is the state of dryness, or the process of drying. The theory here is that when we are young, and our discs are young, our discs have a high water content. When we are young, the center of the disc, called the annulus fibrosis, has an electrical charge that holds onto water very well. The disc is viscous, elastic, and is a good shock absorber. With time, the center of the disk loses water content and the disk starts to “dry out”. I tell patients that all of our intervertebral discs start out as fat plump grapes and eventually end up like raisins. Just like us. Disc degeneration is a more advanced form of disc dessication. In addition to the nucleus pulposus drying out, the disc starts to collapse. Bone spurs form around the edges of the intervertebral disc. Disc degeneration is the same thing as degenerative arthritis. This condition is inevitable. It’s just as certain as death and taxes, and it will happen to everyone if they live long enough. The one thing that predicts whether or not you will have degeneration of your discs is the number of birthdays you have had. The more birthdays, the more evidence you are certain to have of disc degeneration. 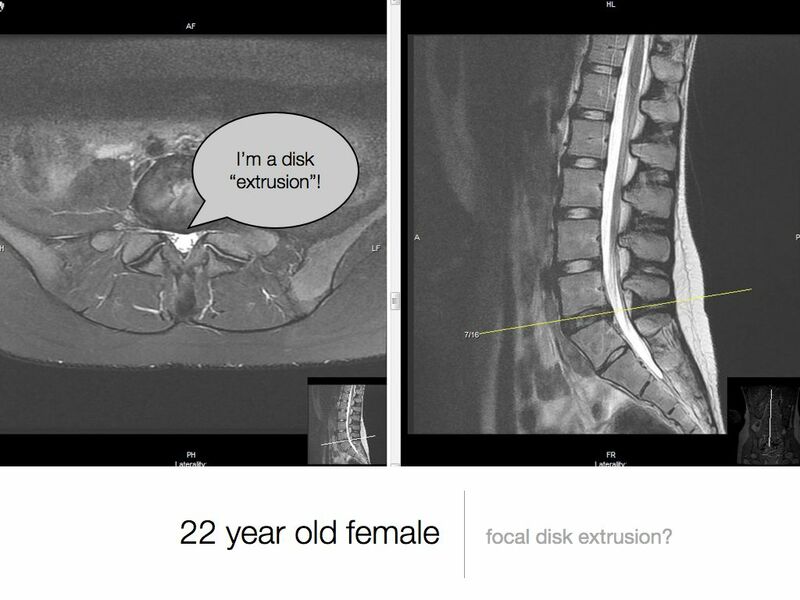 Disc bulges and herniations come in all sorts of sizes and shapes. As the disc starts to degenerate, it can bulge out towards the spinal canal and the nerve roots. 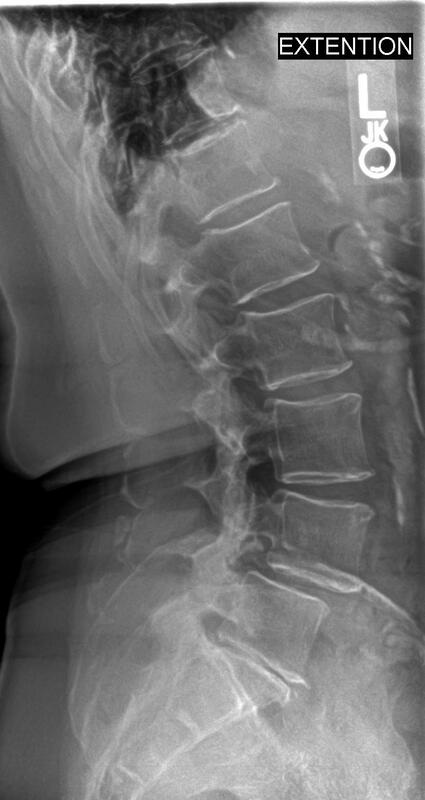 This first example is described by the radiologist as a “herniation”. This herniation is still contained by the annulus. As such, it is probably more accurate to describe this as a disc bulge. 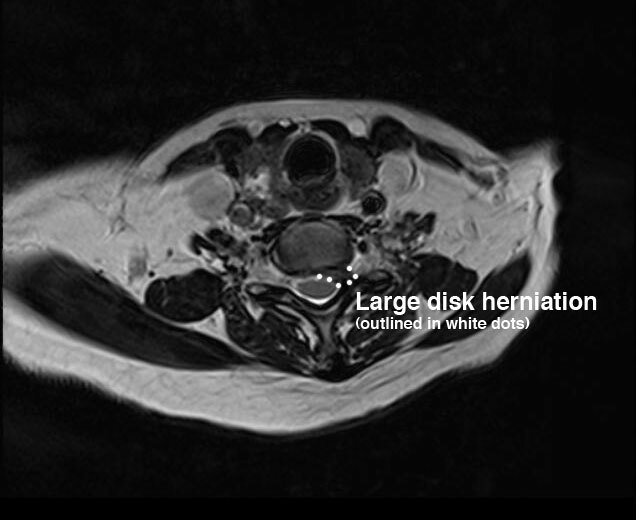 In contrast, this example shows a really large disc herniation. 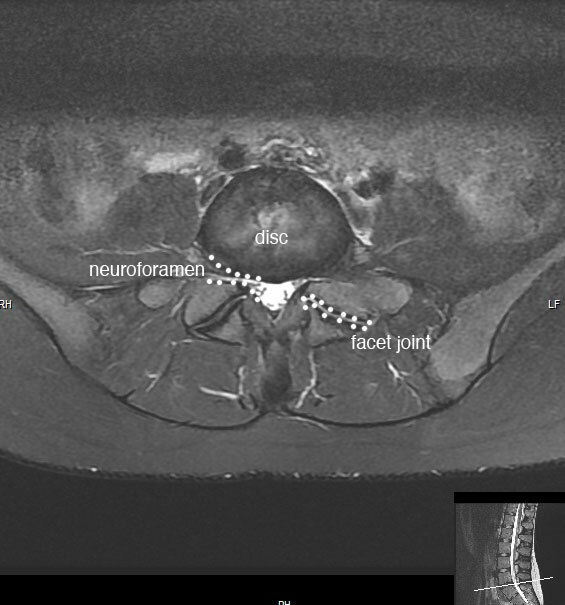 In this case, the nucleus pulposus has herniated completely through the annulus and there is a large free fragment of disc material filling the neural foramen and completely obstructing the normal path for the exiting and traversing nerve roots. Annular tears are a particularly interesting finding on MRI scans. 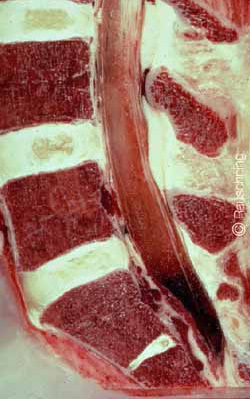 They represent a partial disc herniation where only a few of the fibers of the annulus fibrosis remain. Here is a short video illustrating the typical findings in an annular tear. The end result of all of these changes is spinal stenosis. Stenosis mean “narrowing”. The process of disc bulging, degenerative disc disease, and the development of arthritis of the spine all cause narrowing of the space available for the nerve roots. 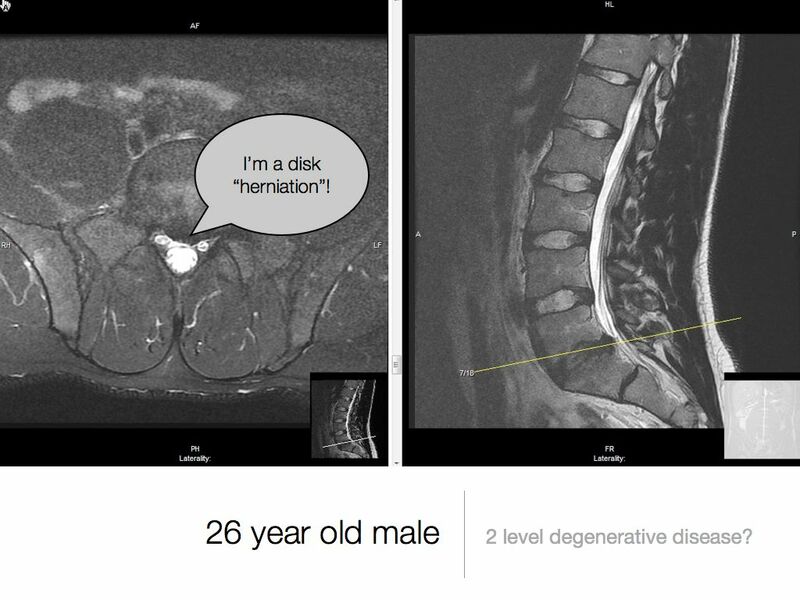 Here is a short video where I review the MRI scan of someone with two level severe spinal stenosis and illustrates this process. Recently, it has become much more common to give the patient a copy of the MRI and report from the radiologist. Unfortunately, this often creates a lot of confusion and concern. 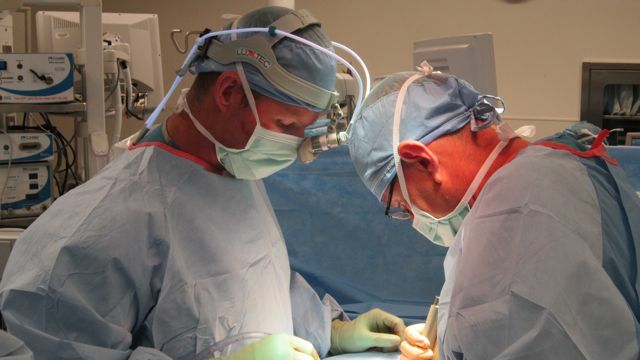 I have been practicing spine surgery in Monterey, California for more than 12 years. About 4 or 5 years ago, ObamaCare mandated that patients be given a health care summary document when they finished seeing the doctor. This applied to MRI scanners as well. Now, it is very common for the patient to see the radiologists report, usually before they see the doctor who ordered the scan. Patients love Google. After an hour or two of typing the words they don’t recognize on their MRI report into the Google search bar they are scared. They arrive in my office CONVINCED that there is something dramatically wrong with their back. I begin by explaining that these findings can be considered a normal part of aging and that they frequently occur in patients without back pain or sciatica. While there is a healthy debate about what constitutes an abnormal versus a normal MRI scan of the spine, there are a few key findings that reveal a problem that we know will require surgery. If your MRI scan does not show evidence of severe stenosis, spondylolisthesis, neuroforaminal narrowing, or a large extruded disk hernation, chances are that you can probably get better without surgical treatment. However, the opposite is also true. If you MRI scan shows that you have a large disk herniation, a free fragment, severe neuroforaminal narrowing, severe spinal stenosis, or a severe spondylolisthesis, chances are, you may need to have an operation after all. The important thing to do is make sure that you have the right operation. I specialize in non-fusion, outpatient, microscopic surgery for herniated disks, spinal stenosis, spondylolisthesis, and sciatica. 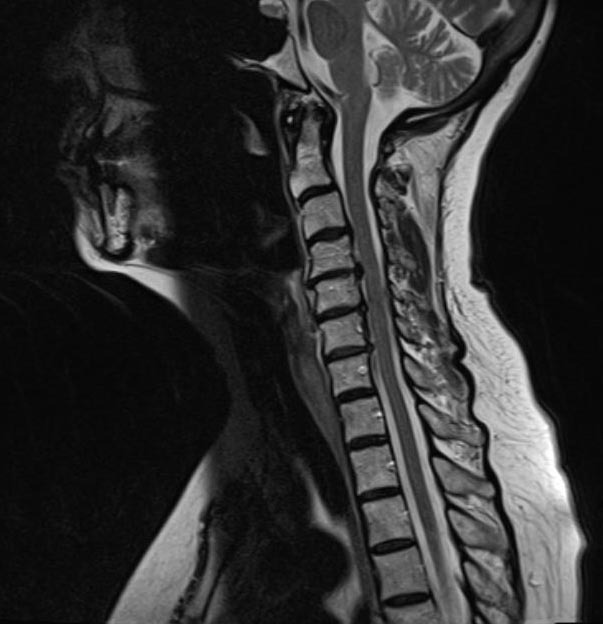 If you think you may be a candidate, I will review your MRI scan to see if we can help you. I have also prepared a short video explaining some of your options so that you can make the right decision about spine surgery. Anterior Cervical Discectomy and Fusion (abbreviated as ACDF) is a surgical procedure for alleviating the severe pain due to nerve root compression caused by a cervical disk herniations. ACDF surgery has been routinely performed since the 1950’s and it is a very reliable procedure. It works best in patients who have an identifiable cause of nerve root compression that has not responded to non-operative care consisting of physical therapy, medical management, and possibly a steroid injection. First the anatomy. 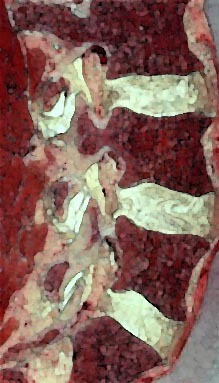 In this first set of watercolors we see a small segment of the cervical spine. 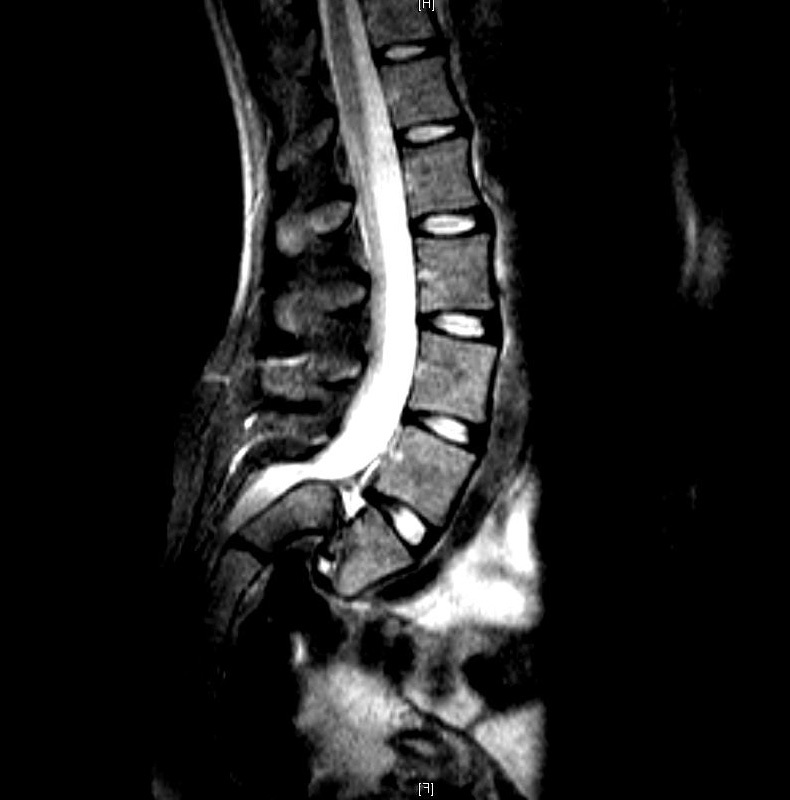 The white strip in the middle is the spinal cord and the surrounding fluid called the CSF. The back of the intervertebral disk is flush with the bone above and below, and there is no pressure on the spinal cord. In the second axial image the spinal cord looks like a white kidney bean in the center of the spinal canal. The cord is symmetric and there is no pressure on any part of the cord. 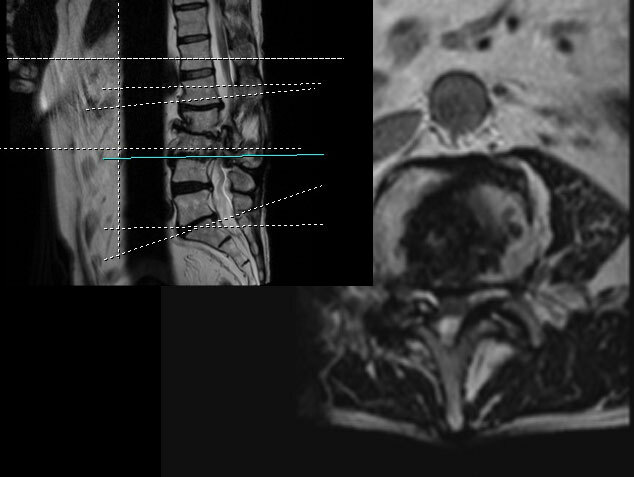 In the third image we see a disk herniation. Some of the shock-absorbing viscous protein in the center of the disk has been squeezed into the spinal canal and it is pressing on the spinal cord. 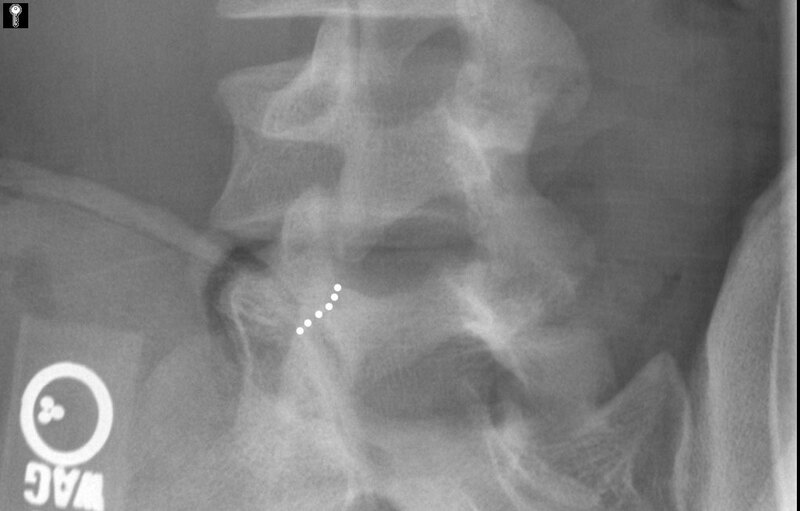 The fourth axial image demonstrates how the cord is often deformed asymmetrically. In this case, the disk herniation is pushing on the left side of the spinal cord and the patient is likely to have left sided nerve root pain. Now the MRI scan. 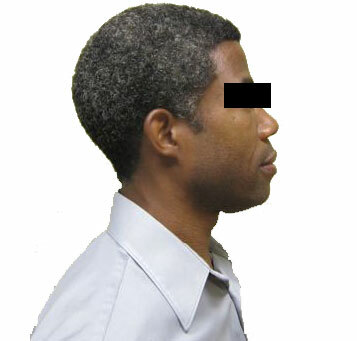 This is a sequence of pictures of someone with a C6/7 disk herniation on the left side. The first image is mid-sagittal MRI scan. 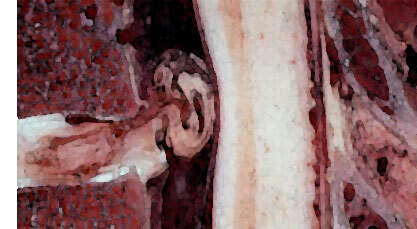 This image is a “slice” from the center of the neck and we can clearly see all of the relevant anatomic structures. 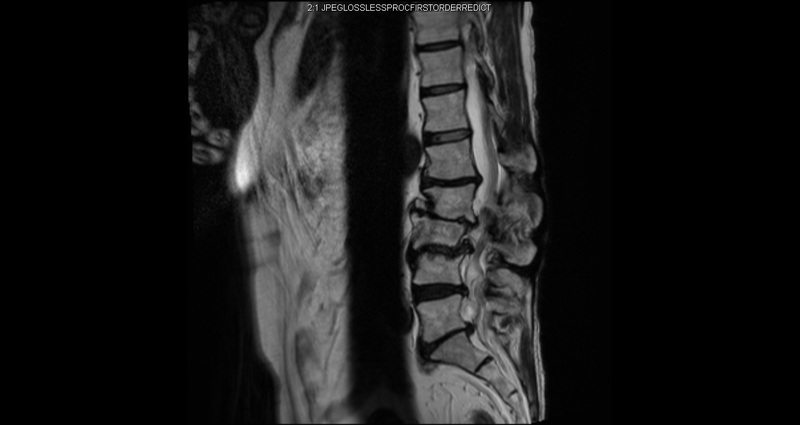 If we move over to the left side by 5 mm, we can see the prominent disk herniation at C6/7. 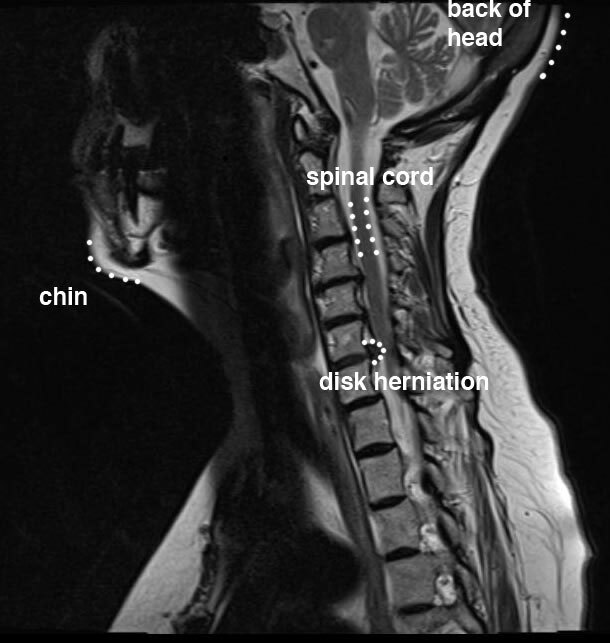 The third image is annotated so that the disk herniation and the cervical spinal cord are more visible. Please click on each image to enlarge the size of the picture. Cross-sectional anatomy — the axial slice. The beauty of MRI scans is that we can use them to look at the human body in any plane. 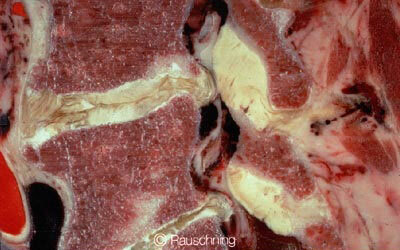 The three images above are called the sagittal slices, but often the axial images are the key to the diagnosis. The first image in this sequence is called the reference image. In this image there is a blue line parallel to the C6/7 disk space. This blue line is the reference plane for images #2 and #3. These two images are a “slice” through the center of the neck and they are oriented as if we were at the feet of the patient looking up towards the head. The anatomic structures on our right are on the patient’s left. 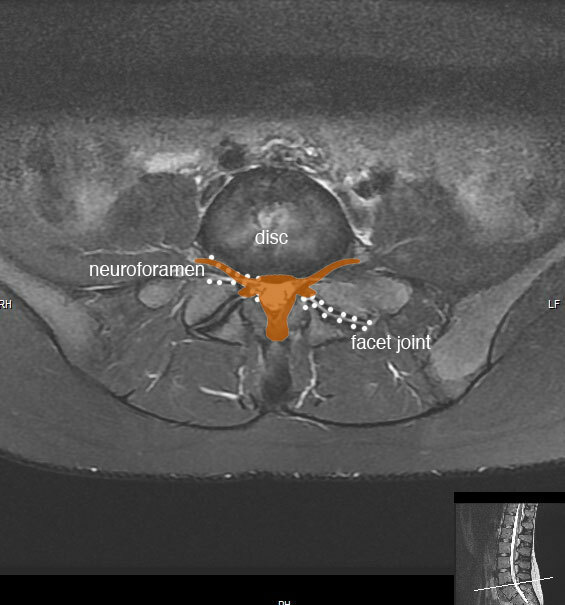 In image #3 I have annotated the disk herniation in order to demonstrate where the nerve root compression is occurring. 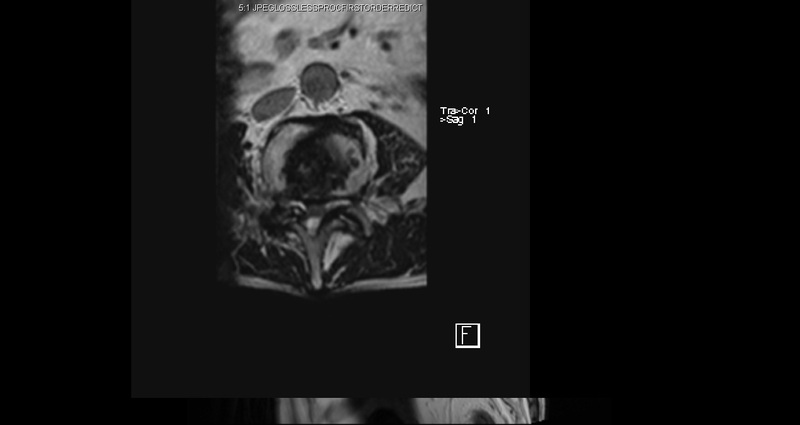 In the fourth image, I present an axial image from the same patient, just above the level of the herniation, so that you can see what the normal dimensions of the spinal canal look like. 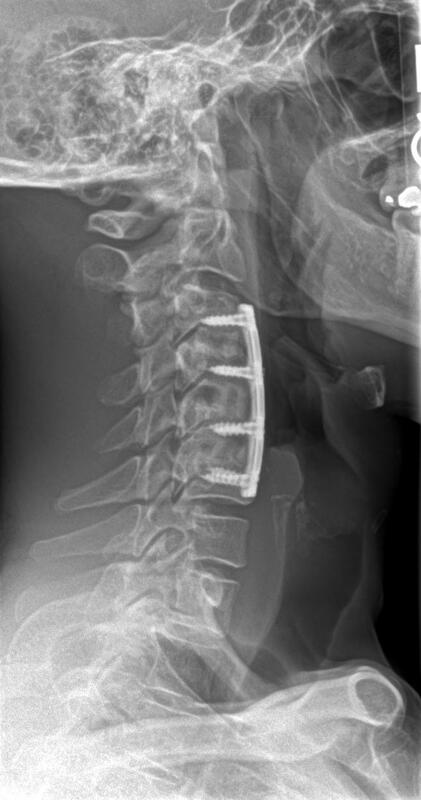 Anterior Cervical Disectomy and Fusion, for the most part, is now an outpatient operation. 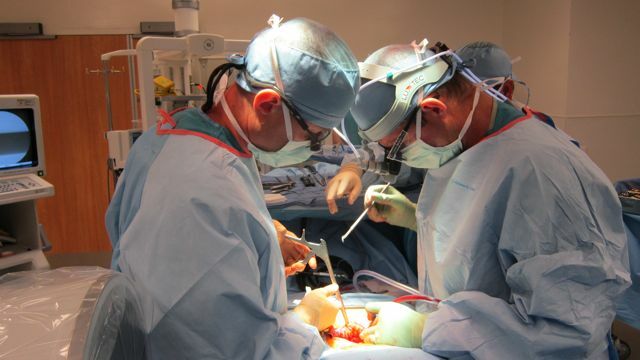 I perform this operation at Monterey Peninsula Surgery Center and the majority of patients go home the same day. Will I lose normal range of motion? One of the most common questions that I get asked is whether the range of motion of the neck will be affected by the operation. 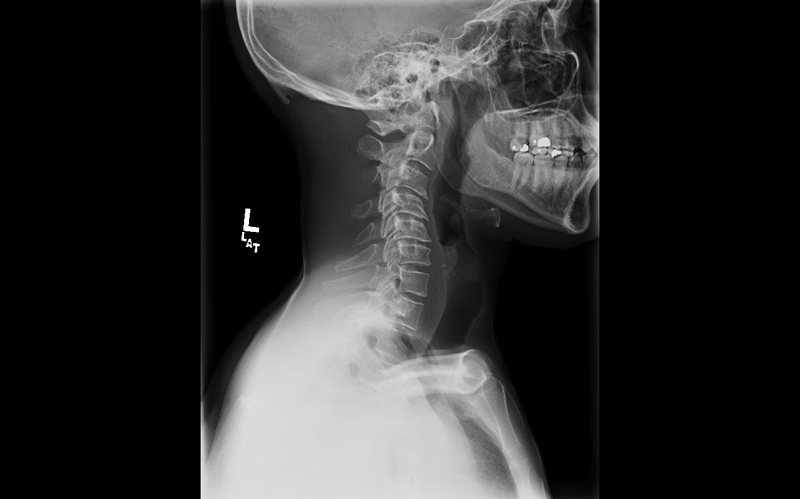 Most patients are concerned about the loss of normal range of motion of the cervical spine if they have a fusion, but this rarely seems to be the case. 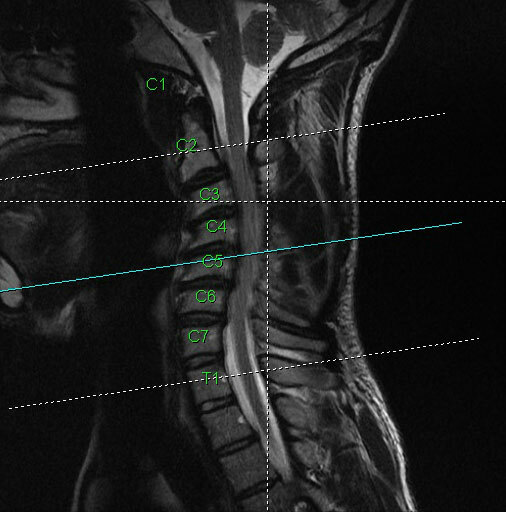 In the first place, about 90% of lateral rotation — twisting the head from sided to side — occurs at the level of C1/C2, and this area is never included in a standard ACDF. Secondly, by the time someone needs an ACDF, usually their spine has developed some arthritis and the range of motion of the disks and spinal segments that need to be fused is already lost as part of the degenerative process. 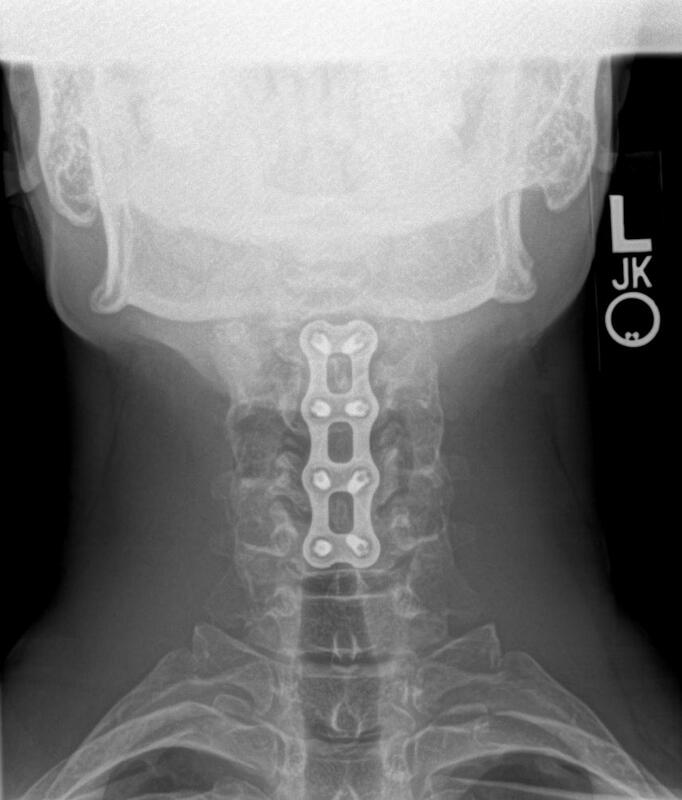 For example, here are a series of pictures from an active duty US serviceman who needed a multi-level cervical fusion for symptoms of cervical myelopathy associated with kyphosis. 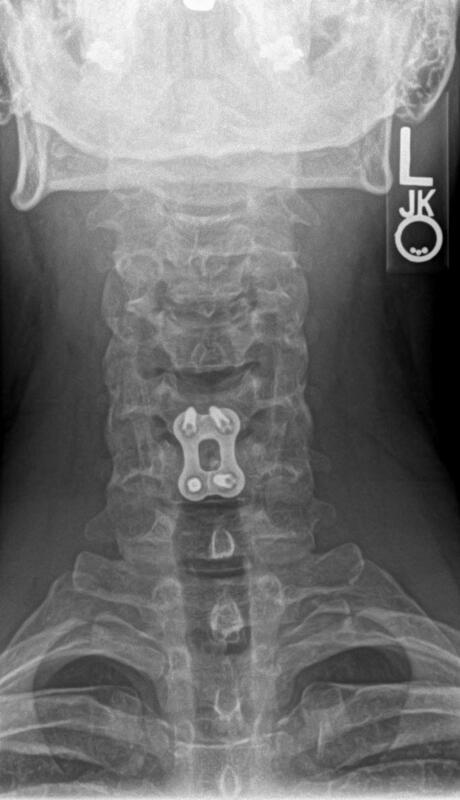 The pre-operative xrays and MRI scans are shown, and the post-operative xray shows excellent correction of his cervical kyphosis. 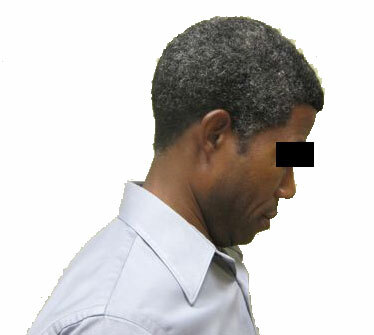 Clinical pictures taken 3 years after the operation demonstrate that he has a nearly normal range of motion of the cervical spine. The surgical incision — will it be noticeable? The surgical incision for an anterior cervical discectomy and fusion runs parallel to the normal lines of the skin in the neck, which are called Langer’s Lines. The skin in this area is typically relatively moveable and it does not form significant scars. For example, here is the incision of a patient who has a 2 level anterior cervical discectomy and fusion about 2 or 3 months before this picture was taken. 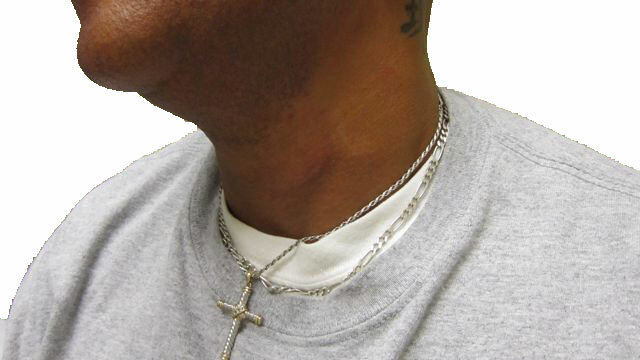 In this image, the scar is barely noticeable, and with time ti will continue to fade even further. According to the literature, temporary or persistent dysphagia (the medical term for difficulty swallowing) can occur in up to 18% of post-operative ACDF patients, but this is much more common in multi-level operations. Typically, a patient will notice that it feels like something is stuck in their throat, or they can’t swallow pills or meat easily. If a patient develops difficulty swallowing, the symptoms will usually resolve over time, and while most people return to normal within a few days, complete improvement may take many months. 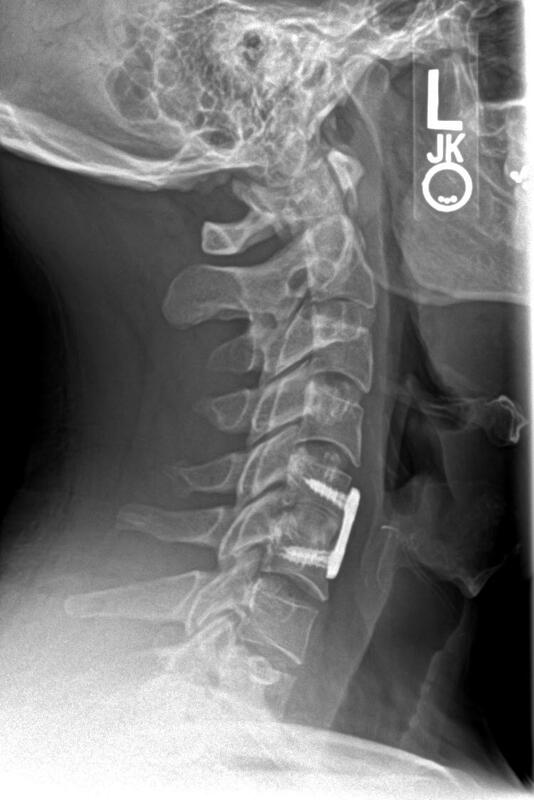 Dyspagia appears to be secondary to local response to traction and manipulation of the soft tissues of the neck since this complication occurred just as commonly when the procedure was performed in the past without the use of a locking plate applied to the front of the cervical spine. 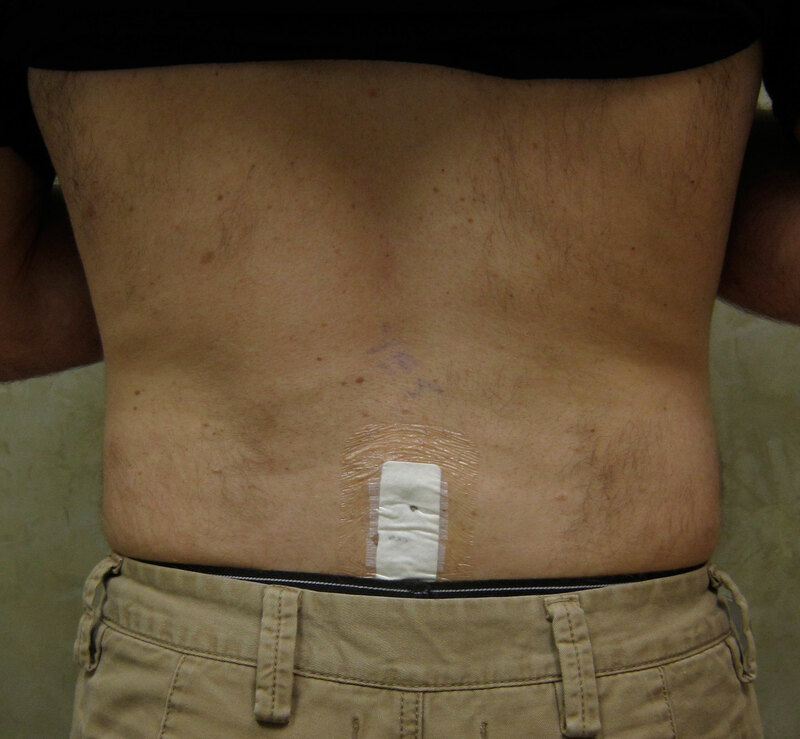 In this gallery of images we go through a microdiscectomy performed at our outpatient surgical center. This is a 40 year old active duty serviceman with a large herniated nucleus pulposus at the L5.S1 level on the right side. 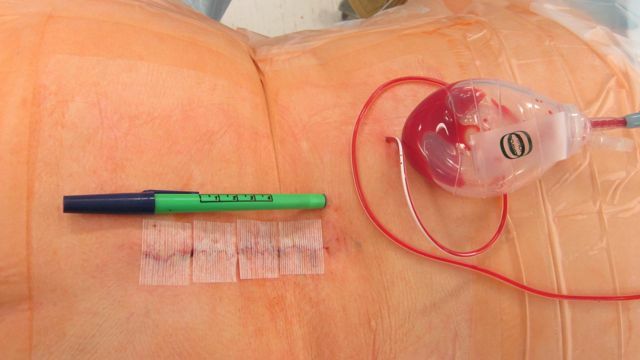 This sequence of pictures documents the steps that we follow as we move from the pre-anesthetic phase of the operation, through induction of anesthesia, positioning and prepping and draping, and then through the actual operation itself. Finally, we close the skin with an absorbable suture, apply a layer of dermabond which seals the skin, and then take the patient back to the post-anesthetic care unit so that he can go home on the same day as the operation. The surgical incision is sewn up with an absorbable suture and then steri-strips are placed perpendicular to the incision. On top of the steri-strips I use a transparent dressing called “Tegaderm”. This dressing sticks to the skin very well and it should be left on until the 1st post-operative visit. Underneath the Tegaderm dressing the steri-strips are left in place until they fall off by themselves, which usually takes another 5 days or so. This gallery of photographs represents the step by step sequence through an anterior cervical discectomy and fusion. 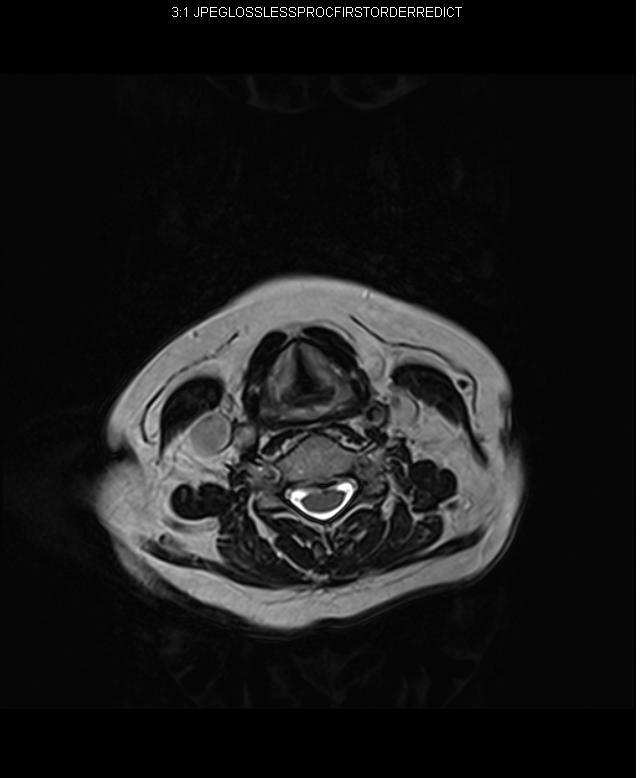 In this case, this is a young south pacific island male with severe central stenosis at C5/6 and C6/7 with cervical myelopathy. First the endotracheal tube is placed by the anesthesiologist, next the anterior aspect of the neck is marked, prepped and draped. The actual anterior cervical discectomy and fusion procedure takes about an hour and a half to two hours for a 2 level case. When the case is finished, the incision is closed with an absorbable suture and covered with a thin film of dermabond which seals the skin. 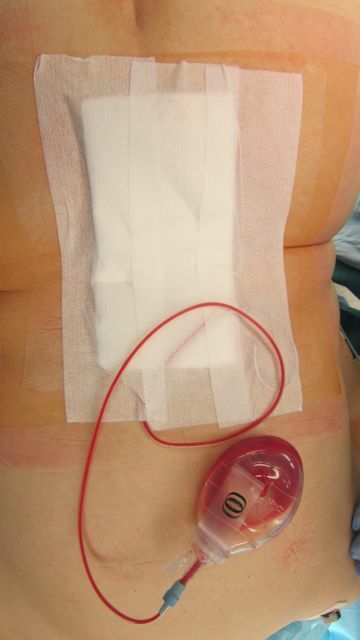 A single steri-strip is place across the incision and the patient is allowed to shower and bathe normally the first day after surgery. Option #2: You can reach my direct office line by calling 831 648 7200. If you leave a detailed message, my assistant or I will call you back — typically within 24 hours.